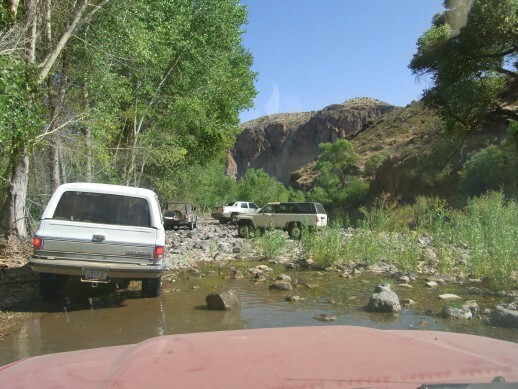 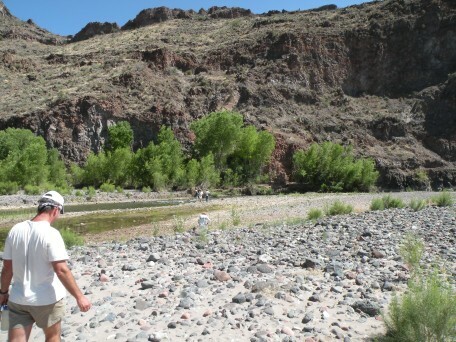 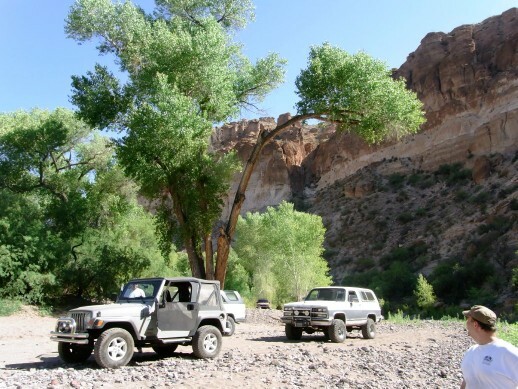 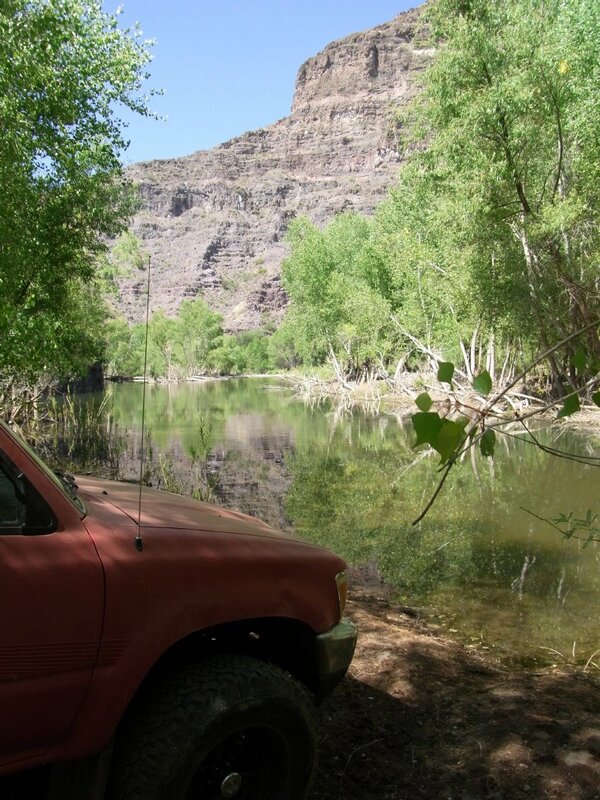 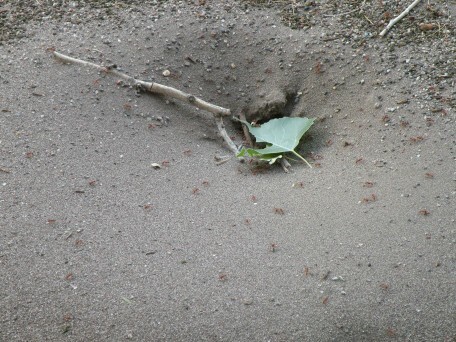 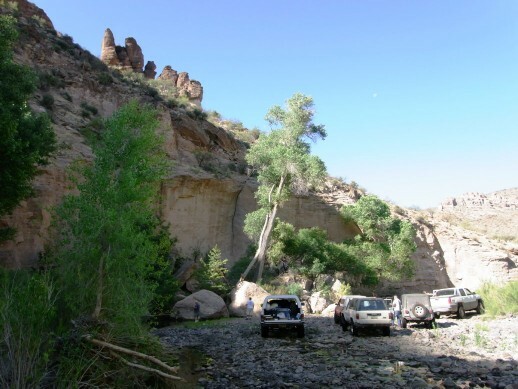 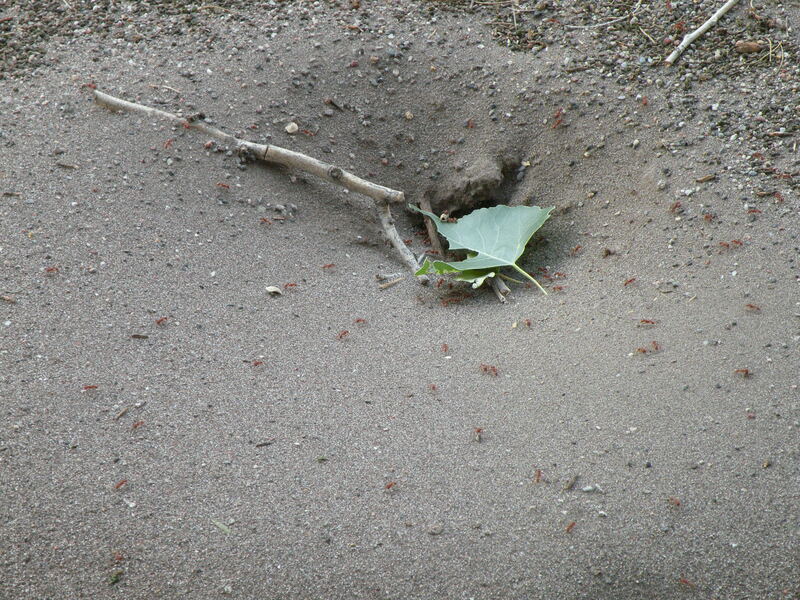 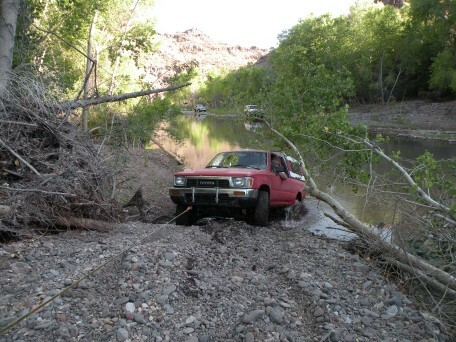 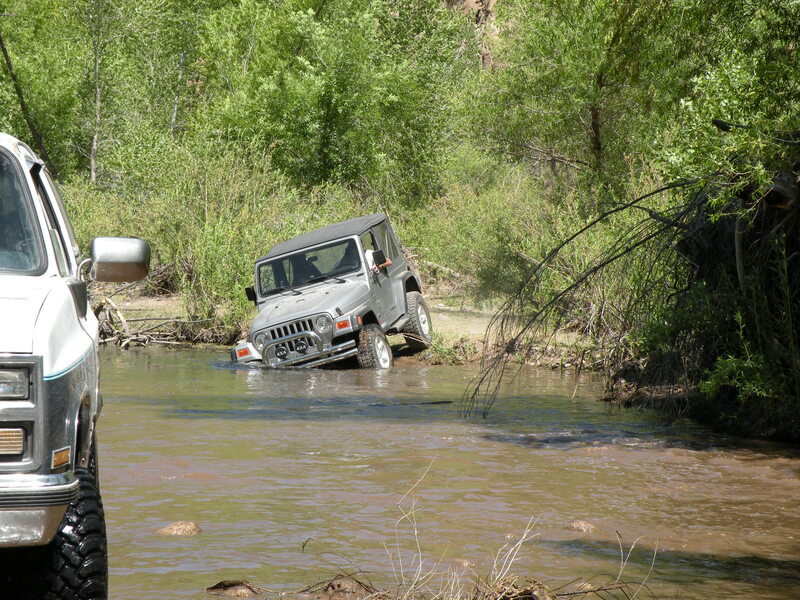 Here's the trip report from our 14-16 May 2009 wheelin' trip to Lower Eagle Creek. 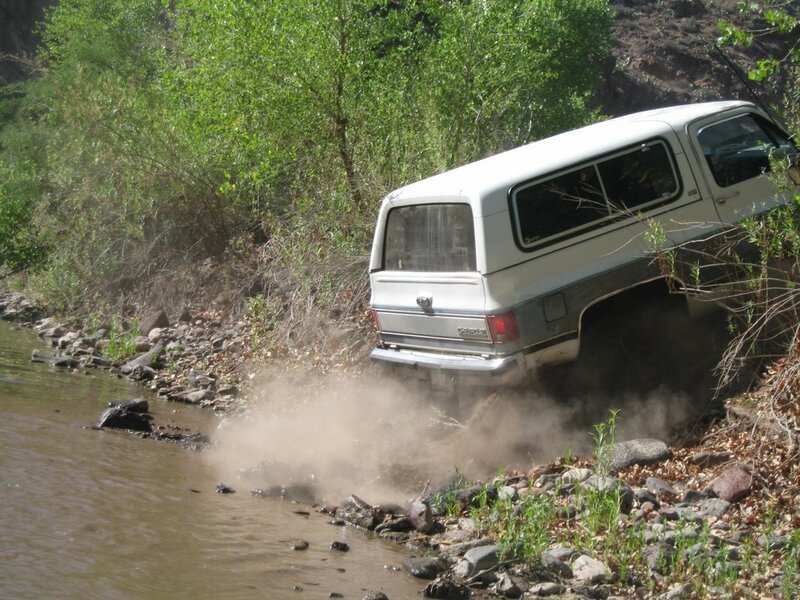 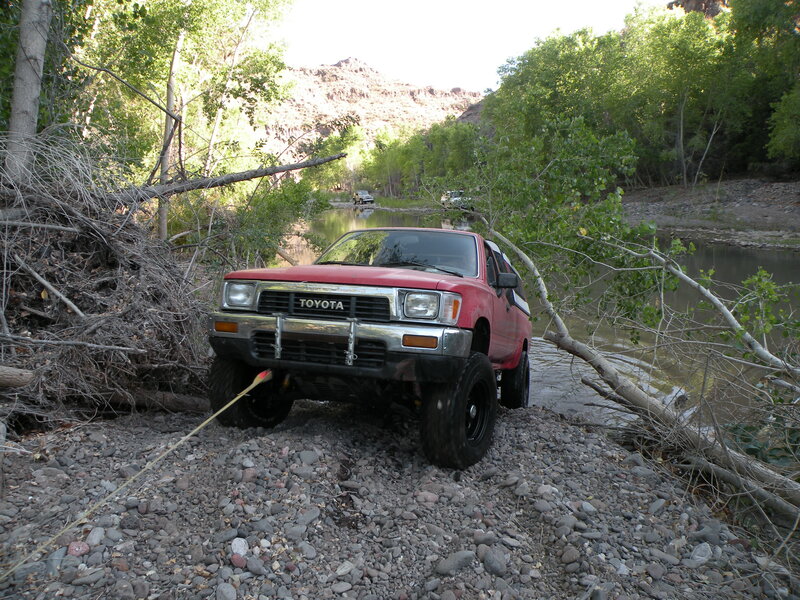 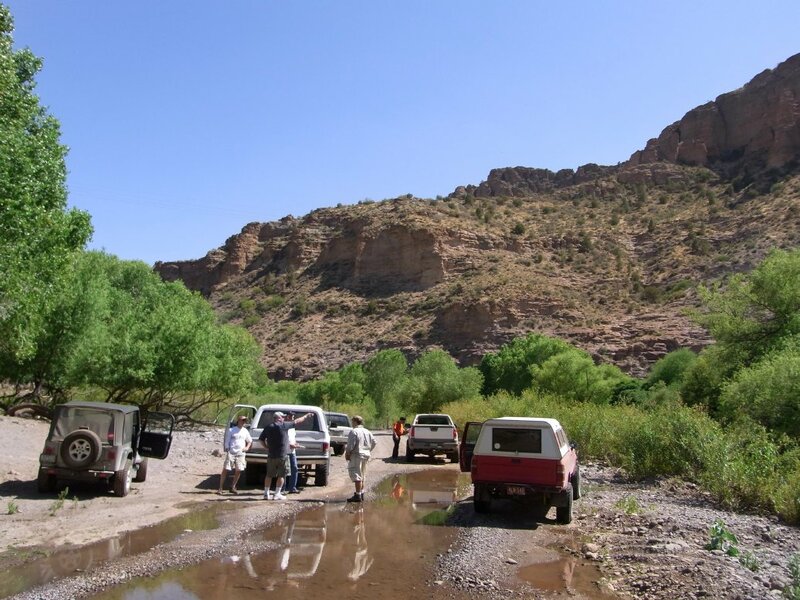 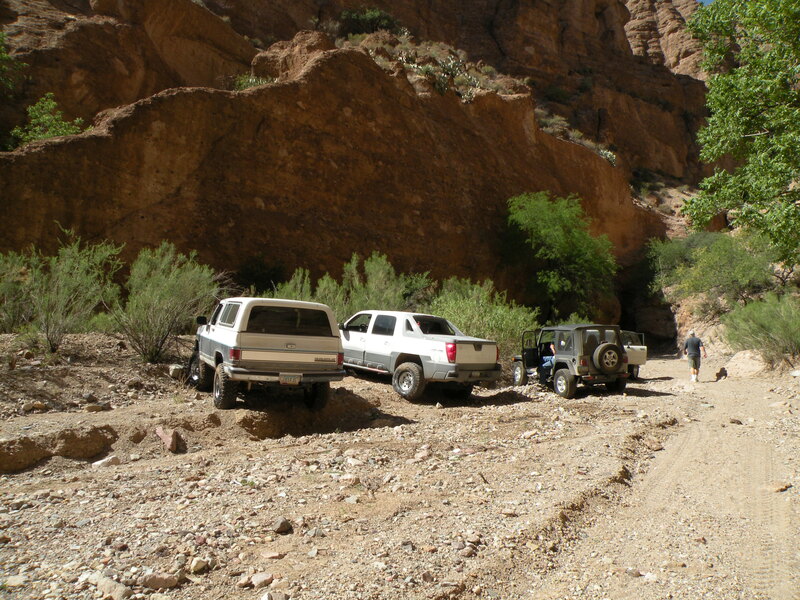 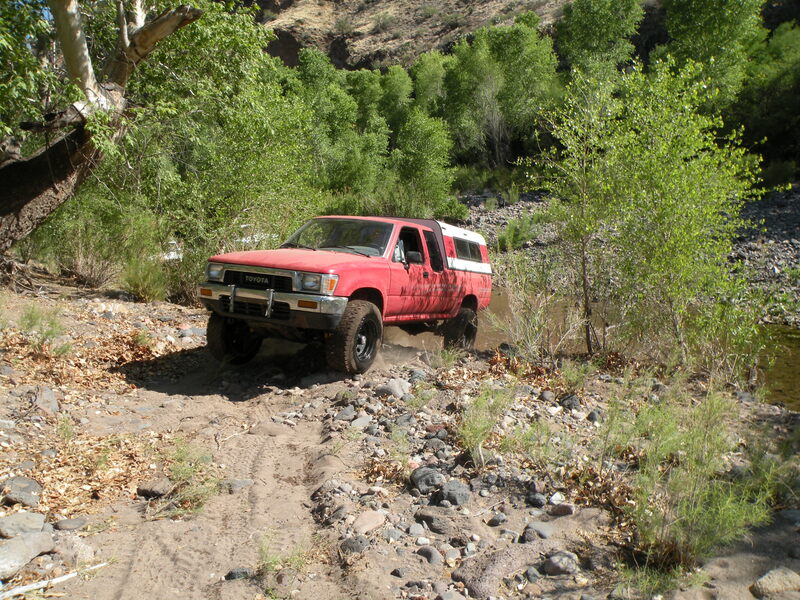 Participants were John H. in his Avalanche, Bob P. in his Blazer, Ron P. in his 4Runner, John S. and Karl M. in John's Toyota P/U, and Rex C. in his Jeep TJ. 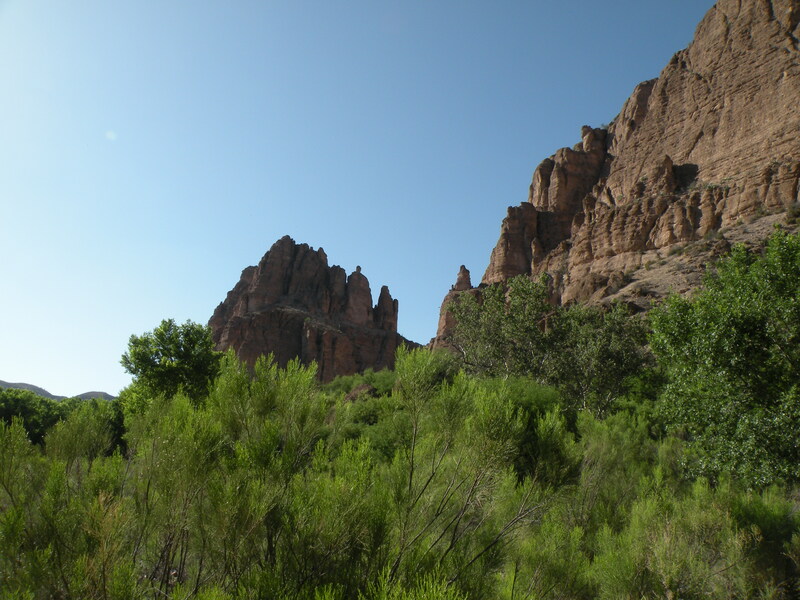 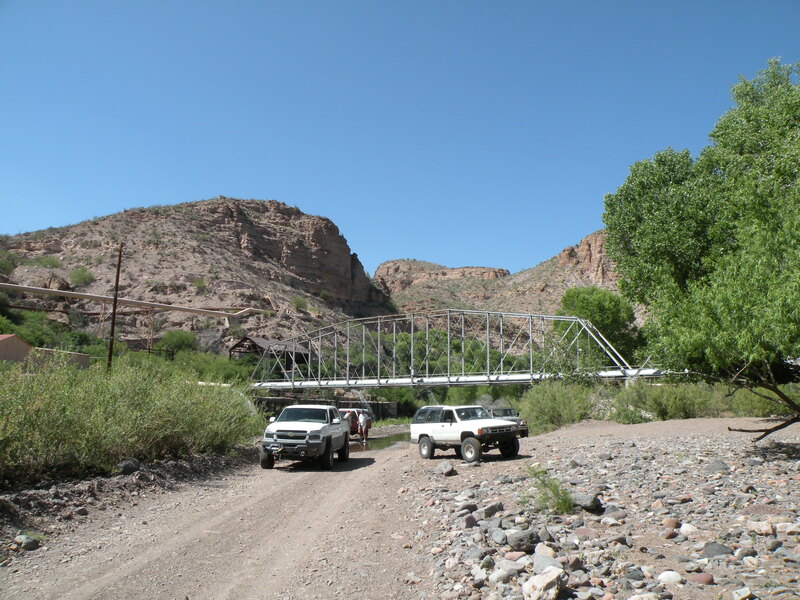 We left the Conoco station in Morenci at 2PM on Thursday and headed down Lower Eagle Creek Road. 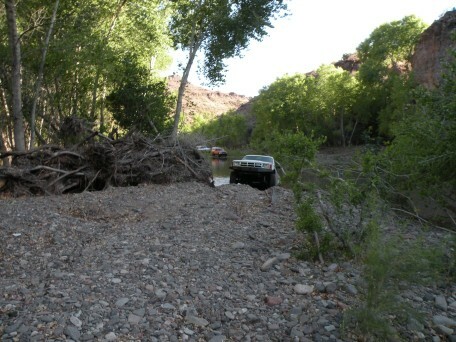 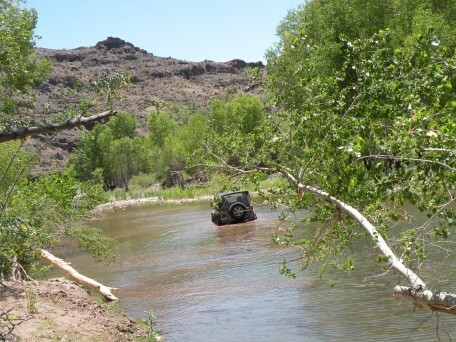 We entered the creek at the pumping station for the Morenci mine. 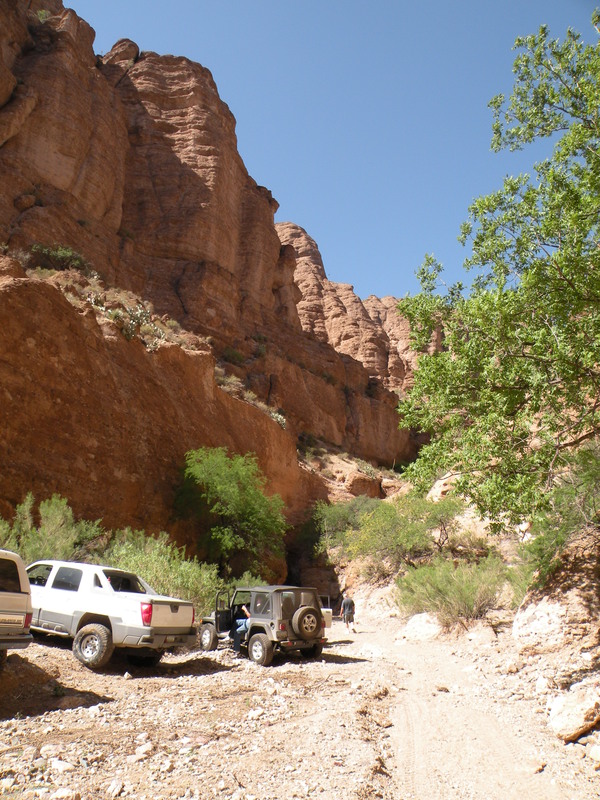 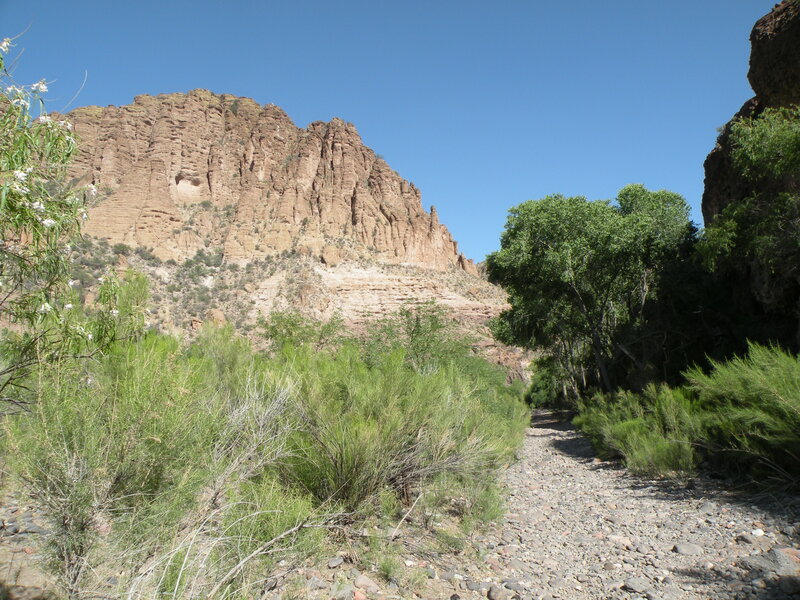 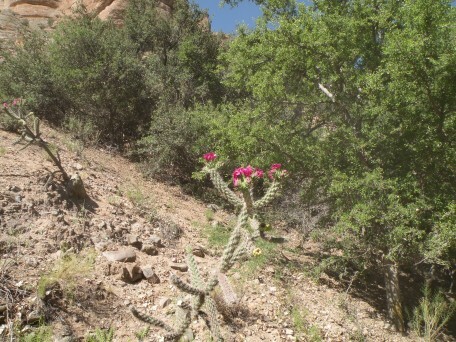 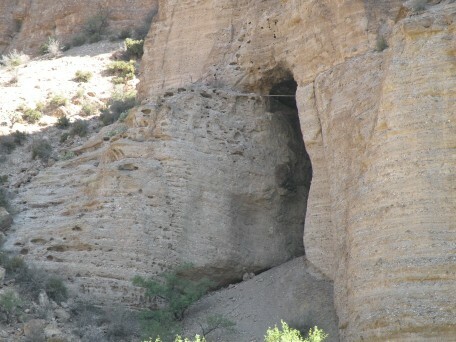 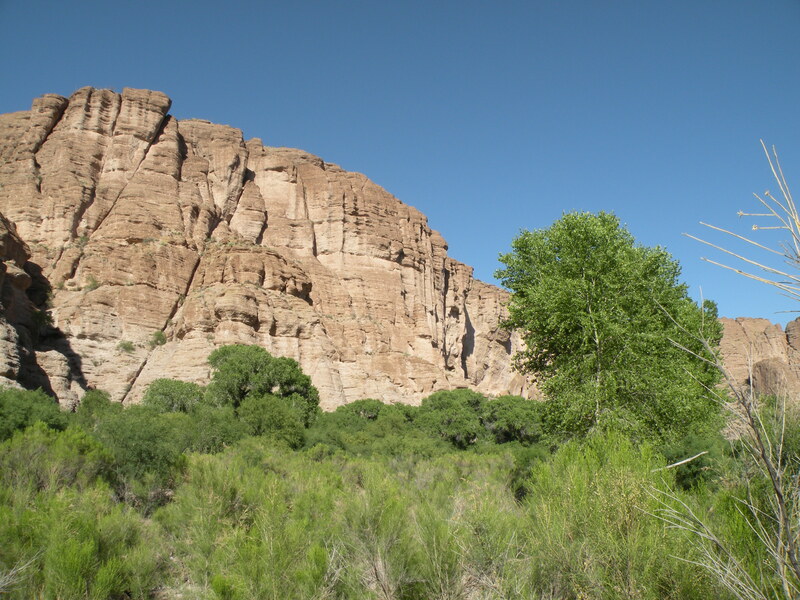 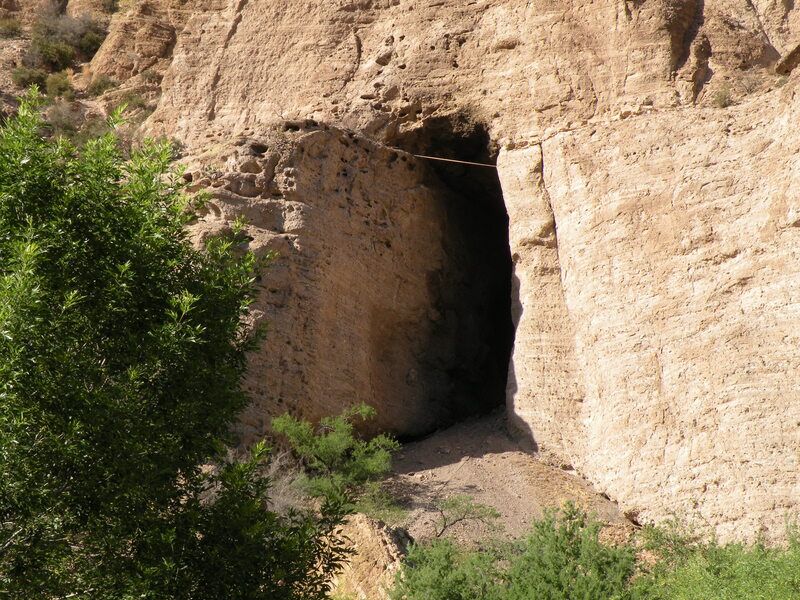 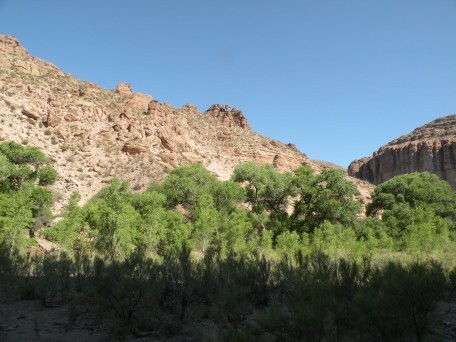 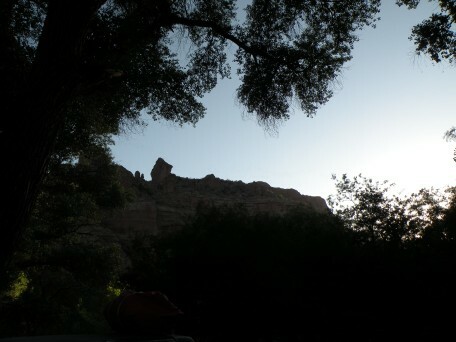 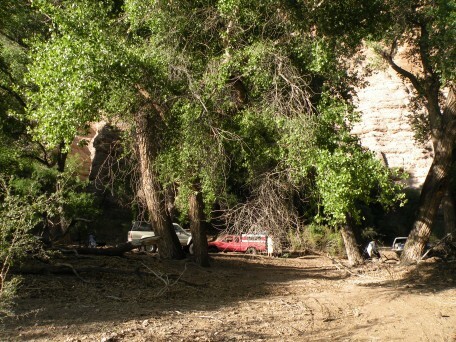 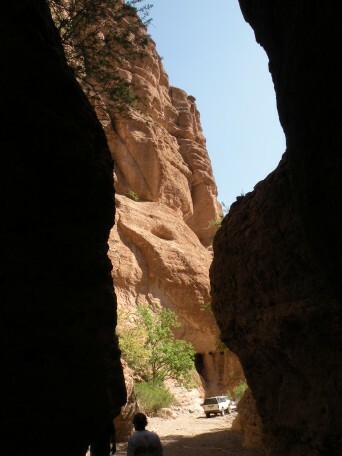 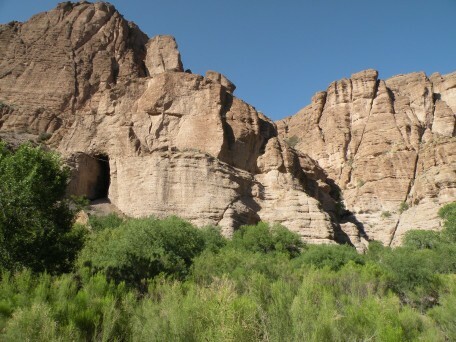 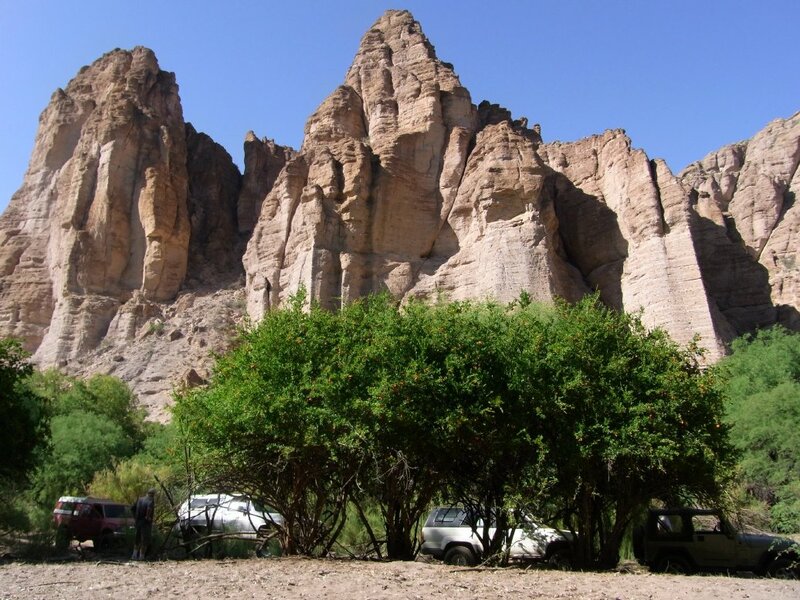 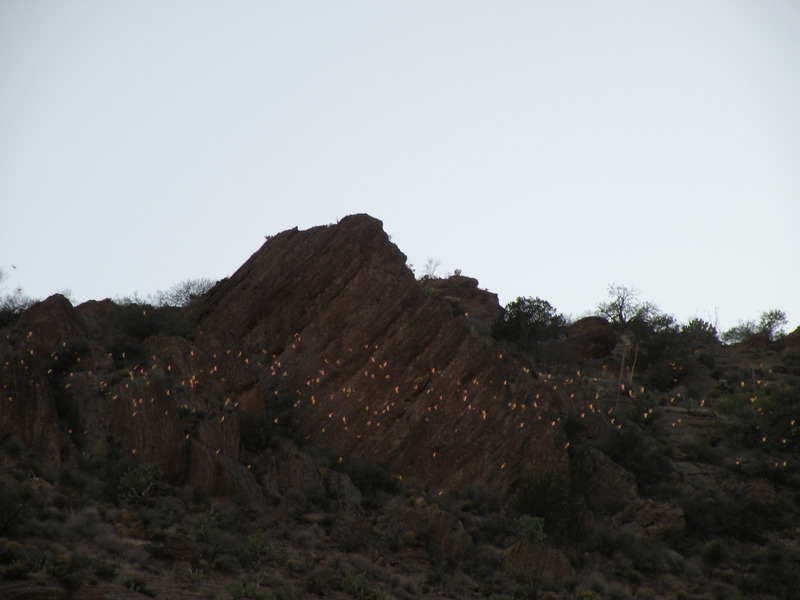 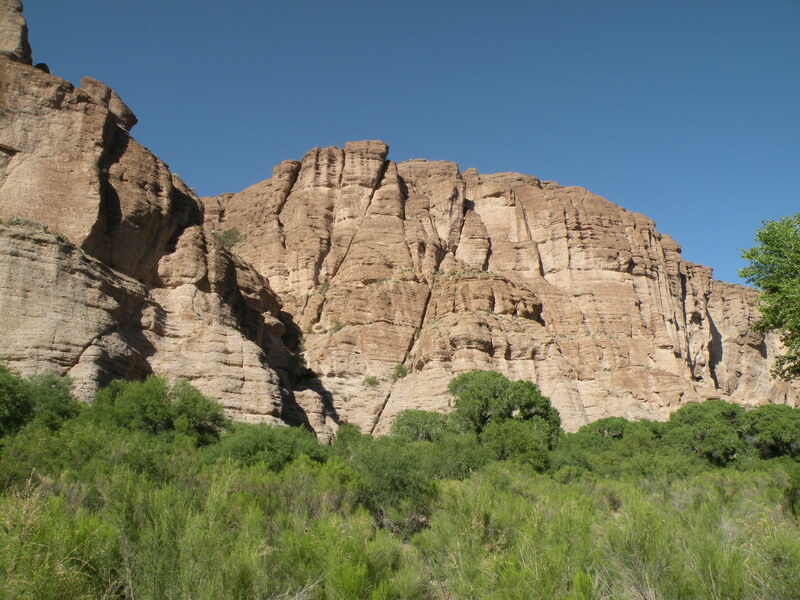 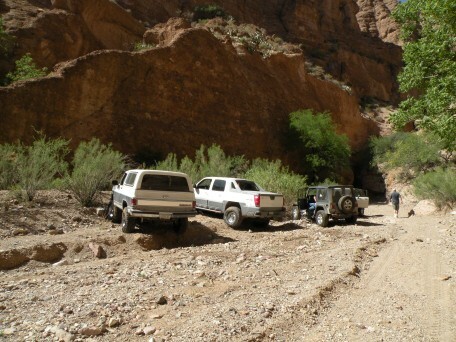 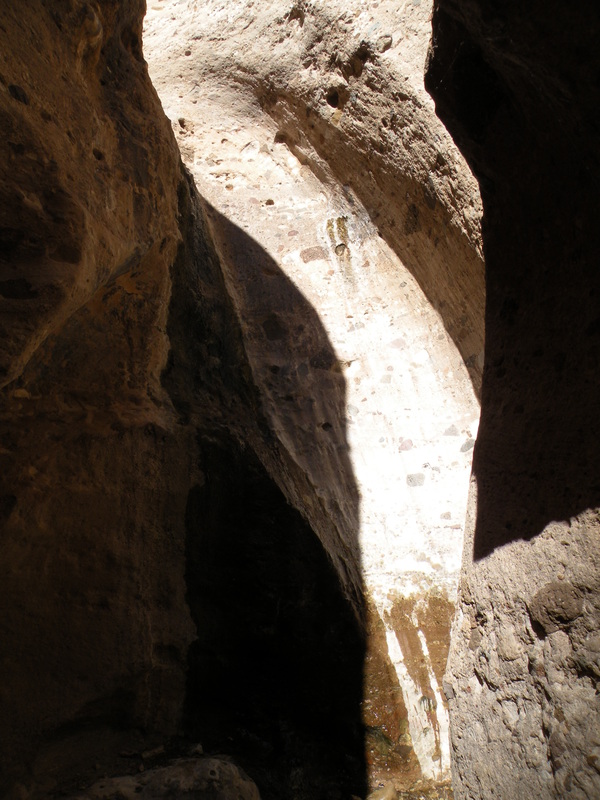 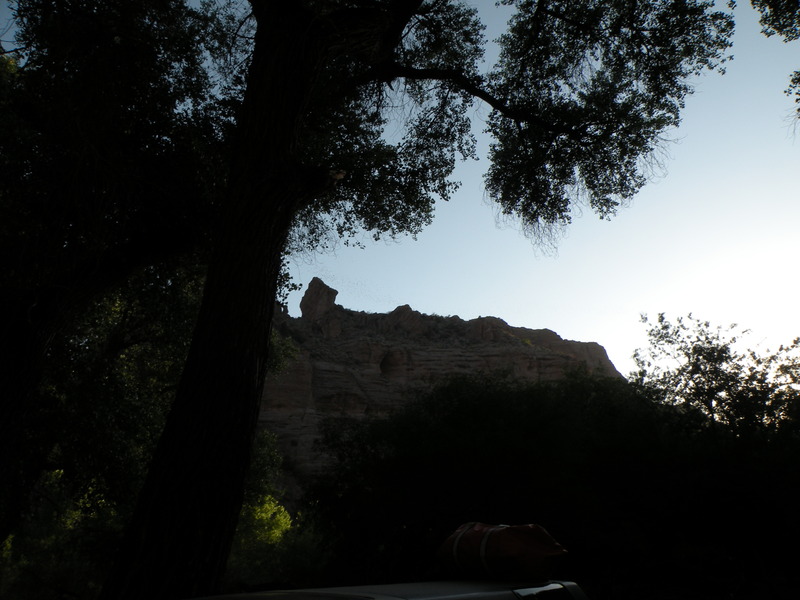 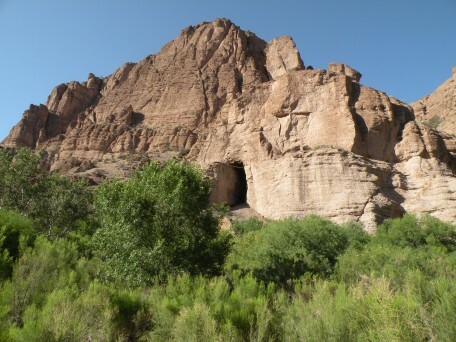 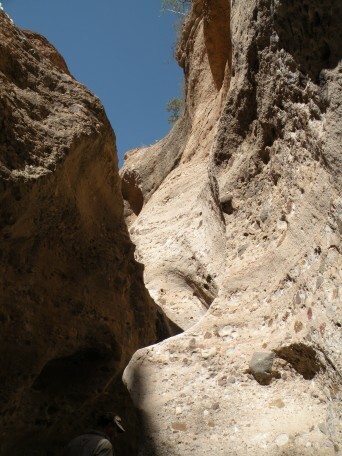 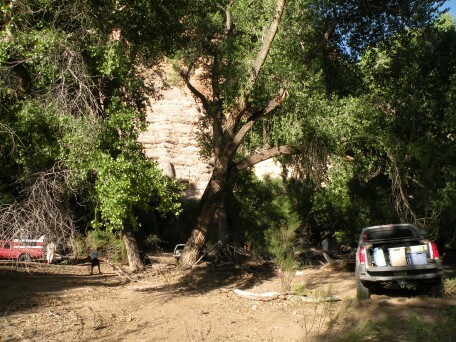 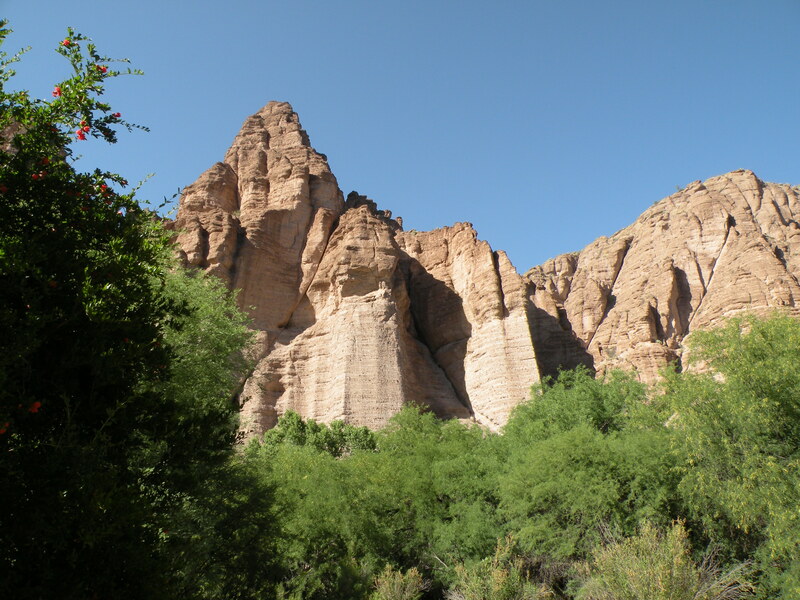 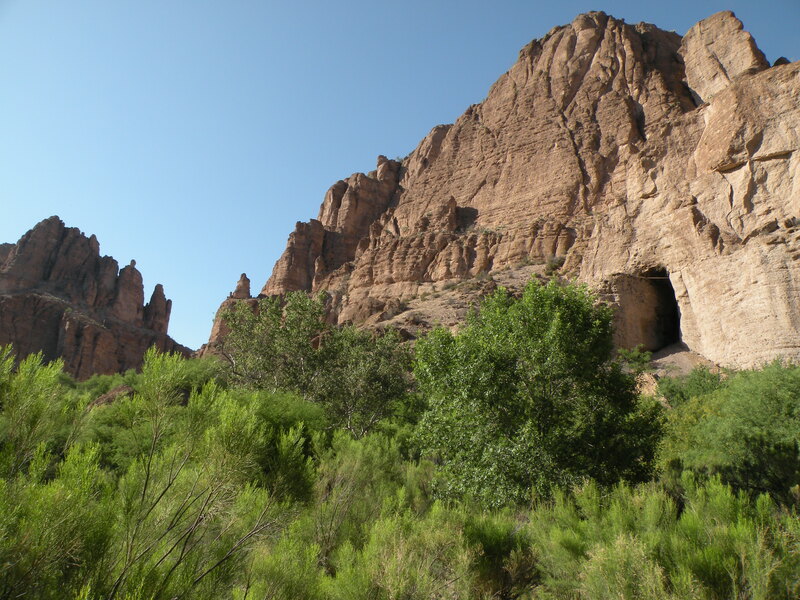 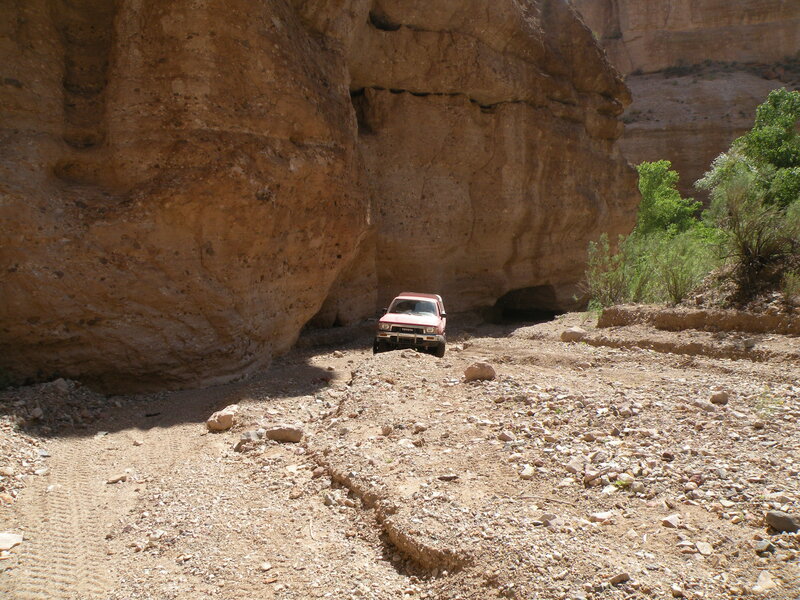 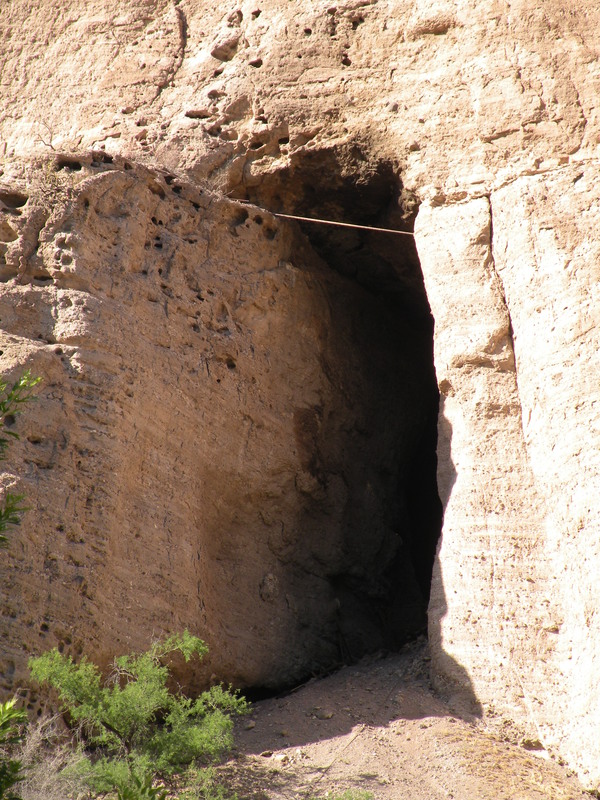 We were at the Bat Cave by 4PM with a stop at the Gold Gulch slot canyon along the way. 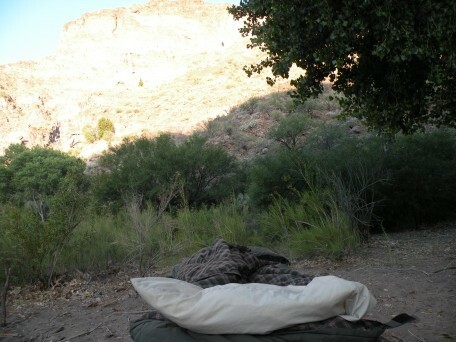 John H. saw a bear just before arriving at the Bat Cave, so those sleeping on the ground endured bear jokes all evening. 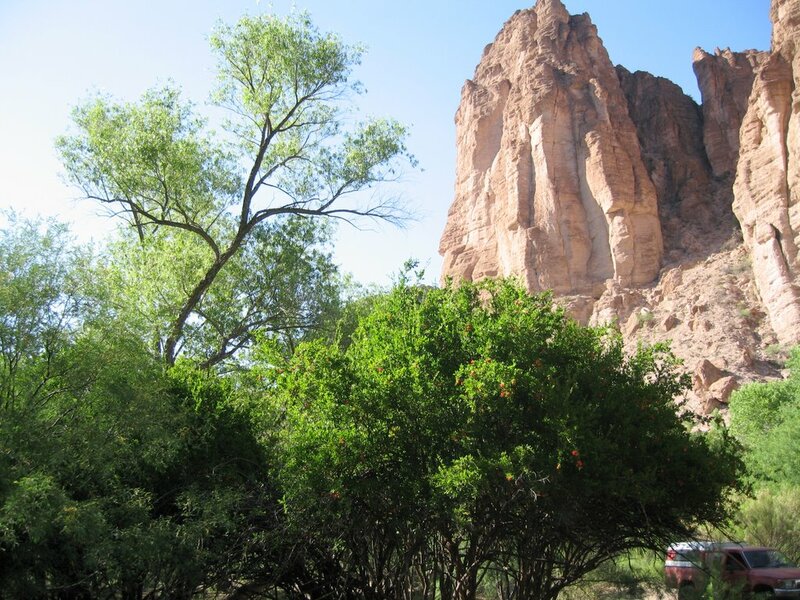 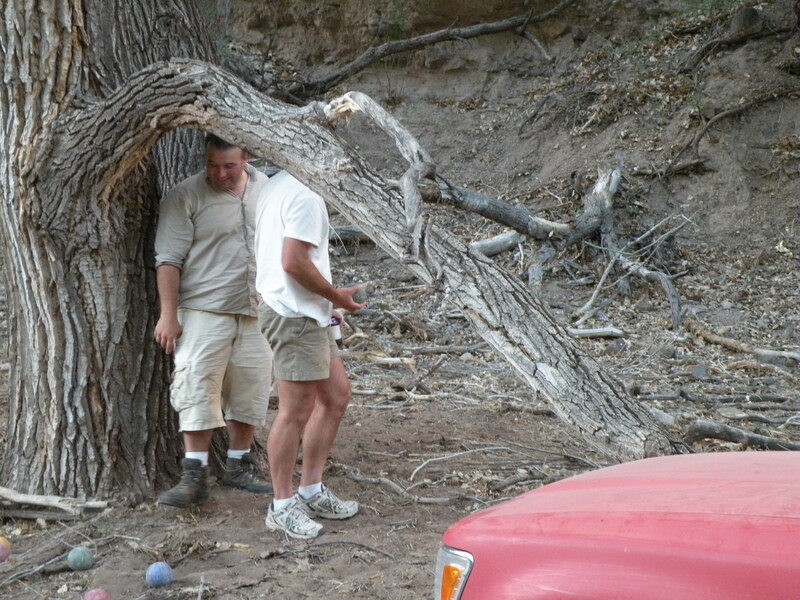 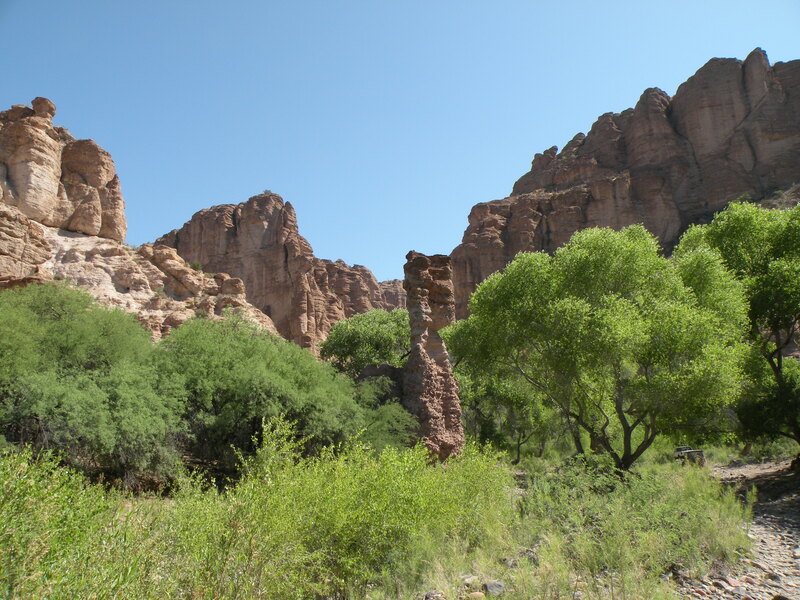 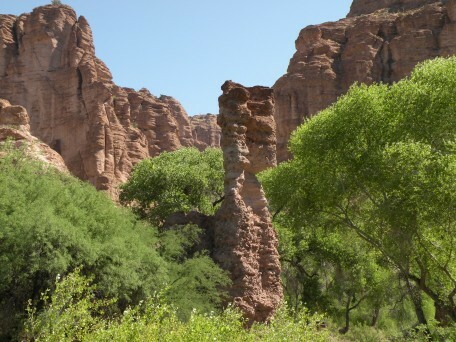 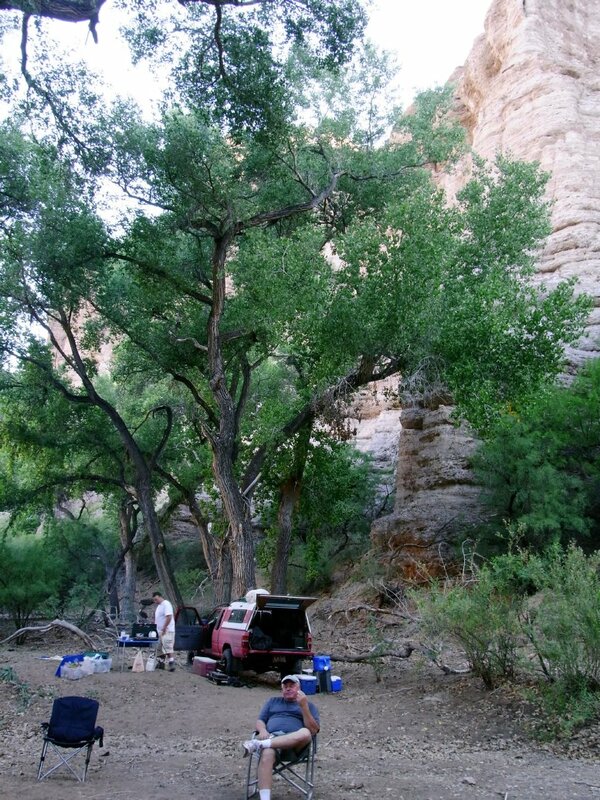 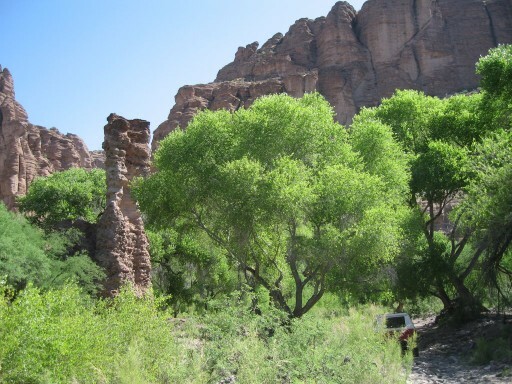 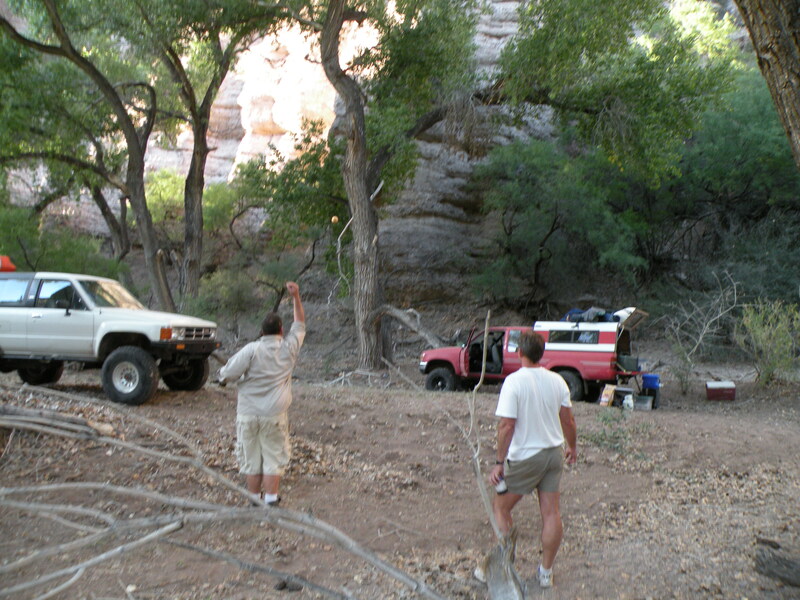 Because it was quite warm (mid-90's) we selected a heavily-shaded campsite about 300 yards south of the Bat Cave. 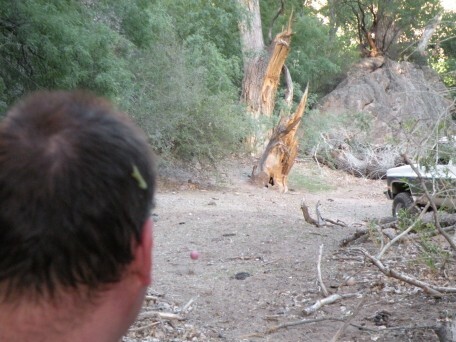 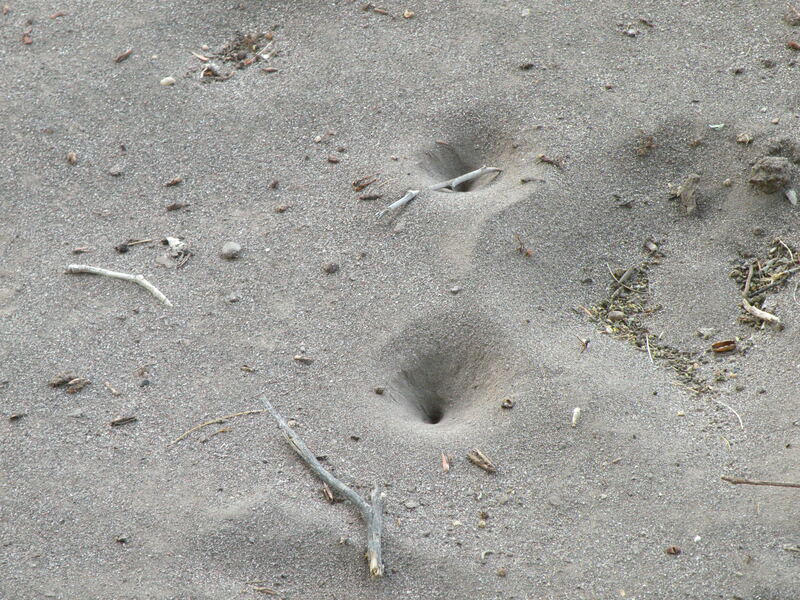 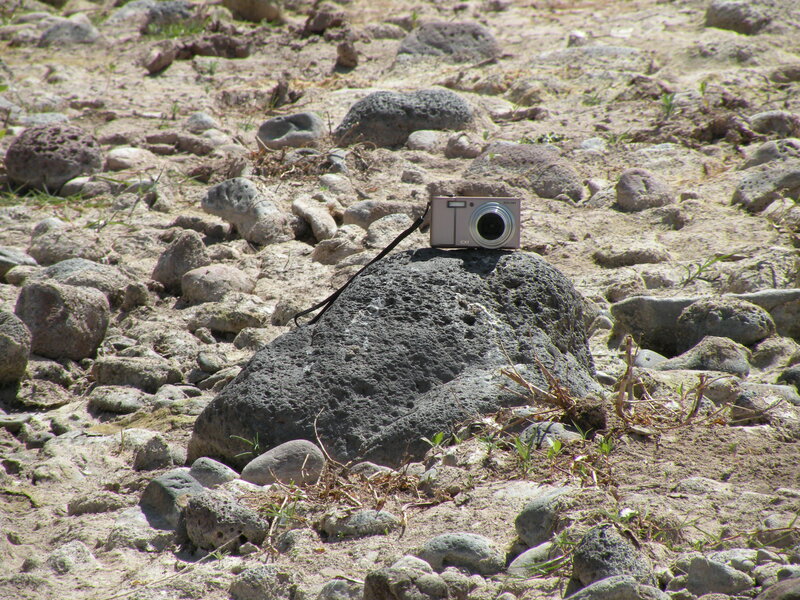 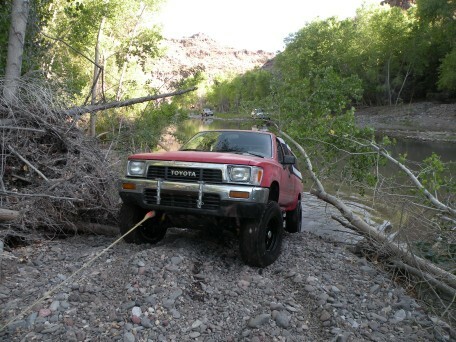 This provided the extra fun of climbing a gravel bar to get into the campsite. 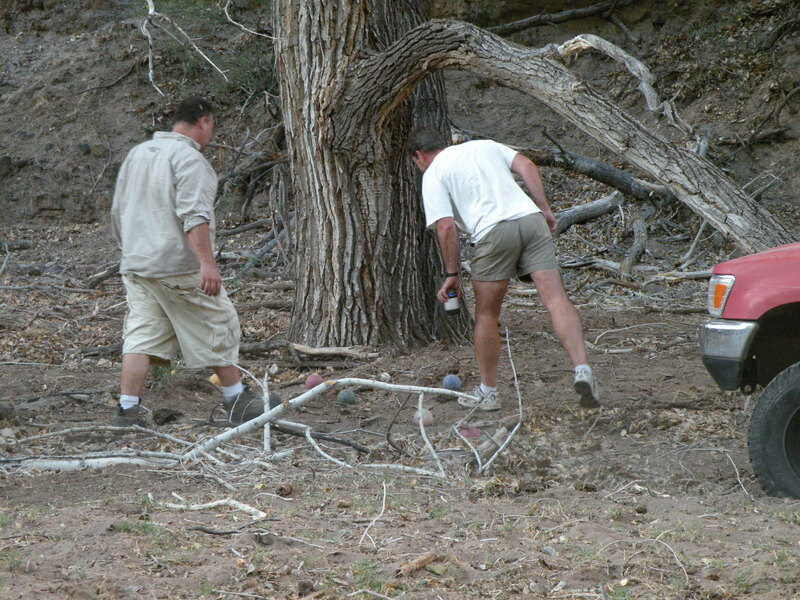 While waiting for the bats, John S. and Karl played the most all-terrain game of bocci that I have ever seen (sand, rocks, trees, leaves, roots, trucks .... no manicured lawn here). 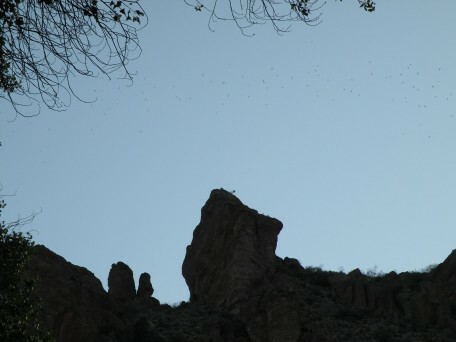 The bat flight surprised us as they came out about 15 minutes before sunset (30 minutes earlier than expected), so we only caught the end of it. 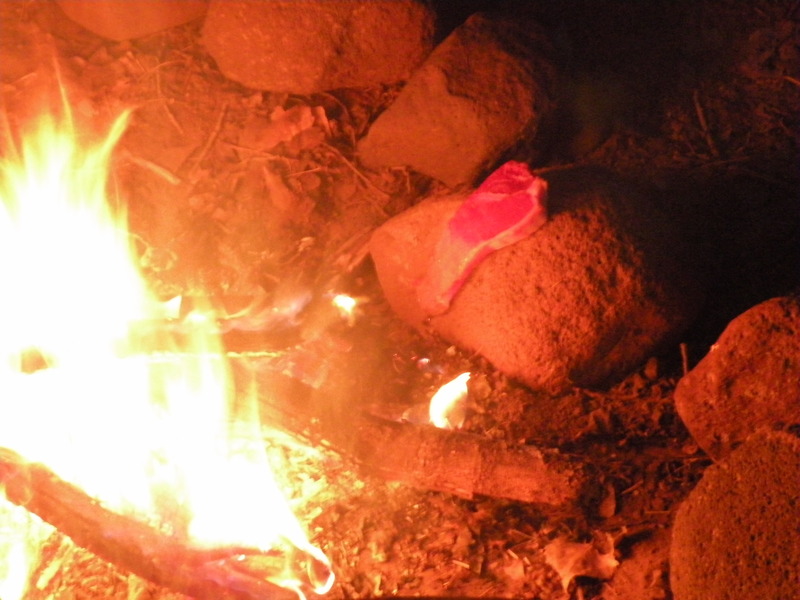 We had a token fire for cooking, but there was no issue of keeping warm in the evening. 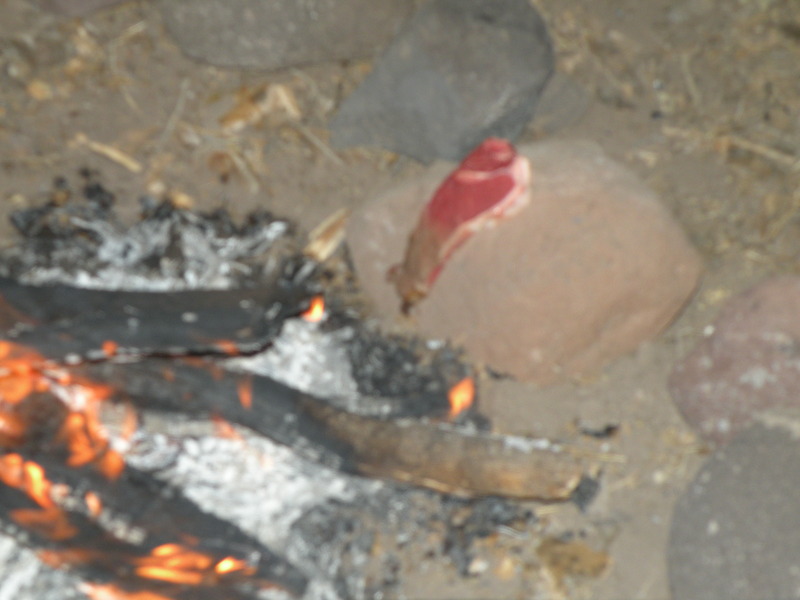 John H. demonstrated his technique of cooking steak on a rock next to the fire. 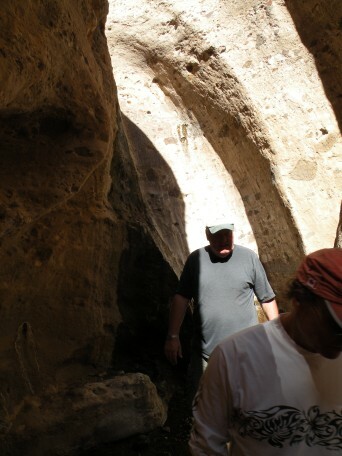 Click Here for a short Quicktime slide show (9.8 MB) by Rex C. that really captures the spirit of the trip. 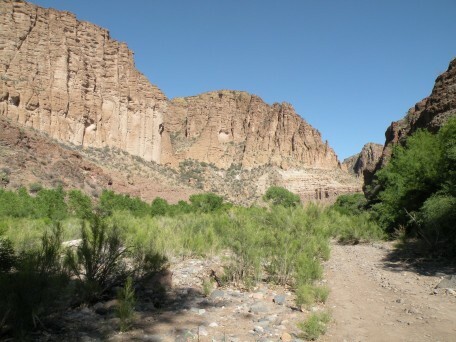 Looking out from the Gold Gulch slot. 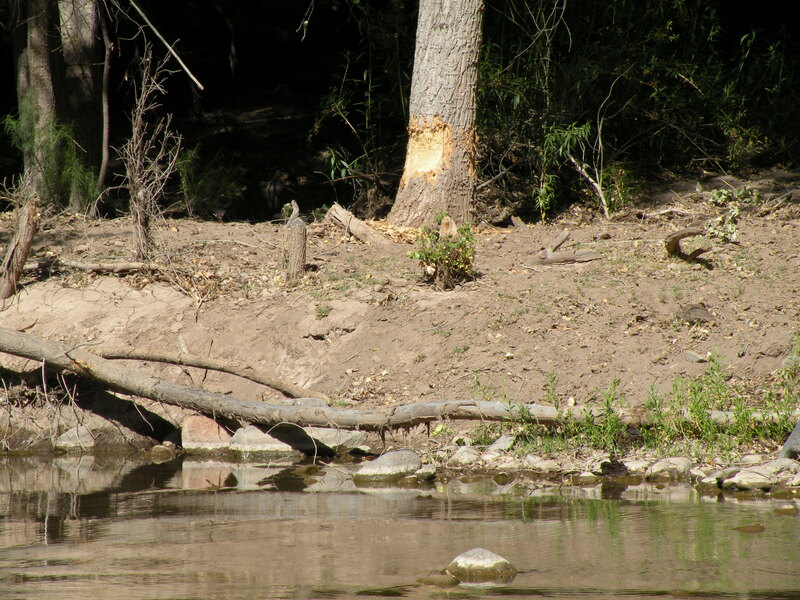 An ambitious beaver lives nearby. Entrance to the Bat Cave. Bat flight from the bat cave. 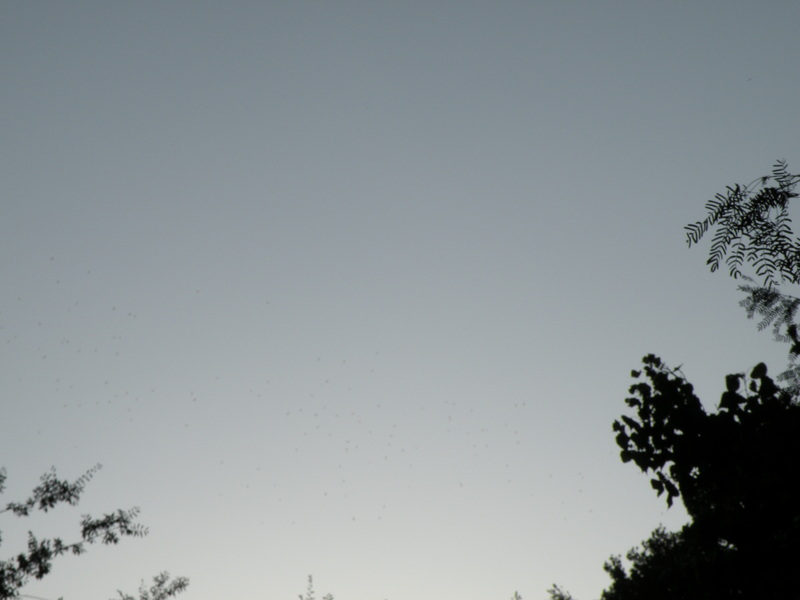 Bat flight about 15 minutes before sunset. 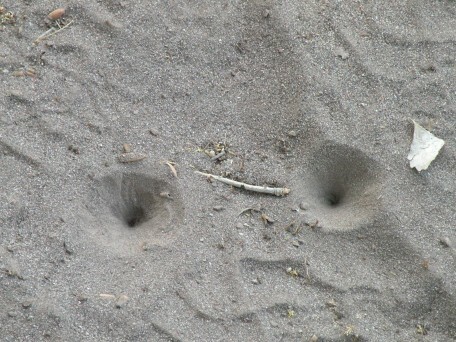 The tail end of the bat flight. Cooking steak on a rock next to the fire. 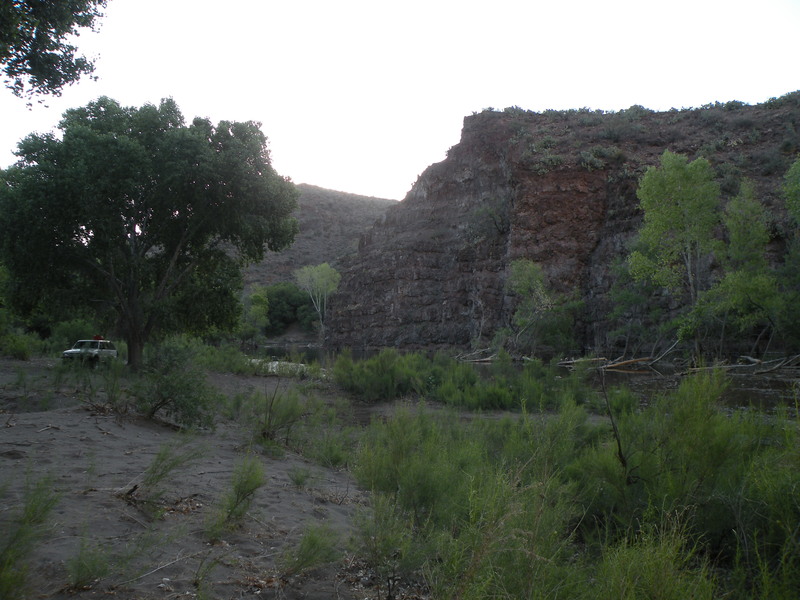 The old schoolhouse above the pump station. 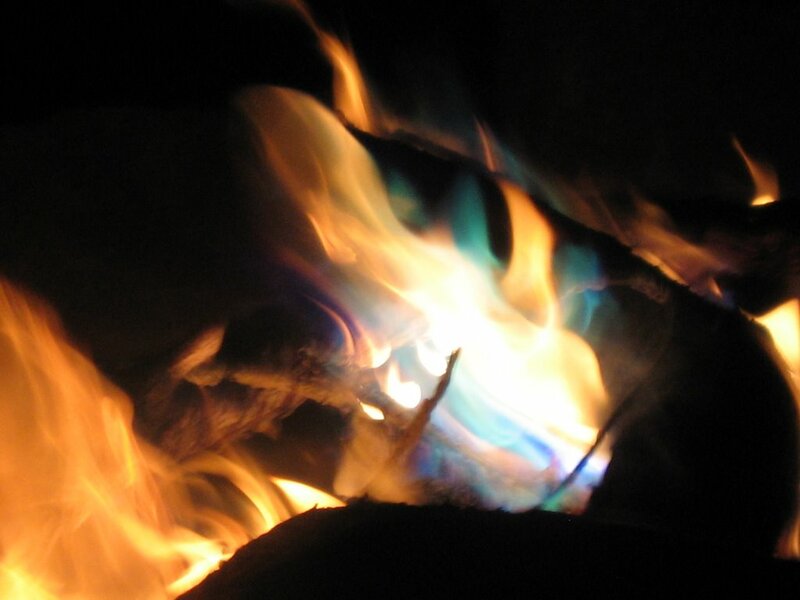 Blue flames in the campfire. 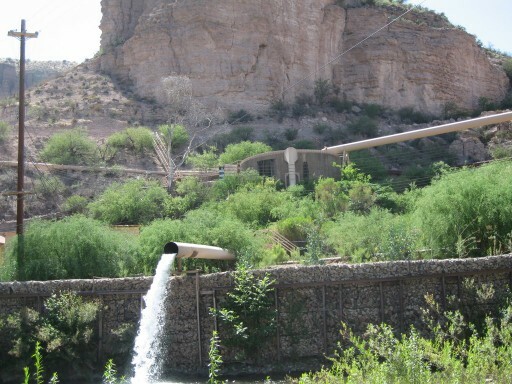 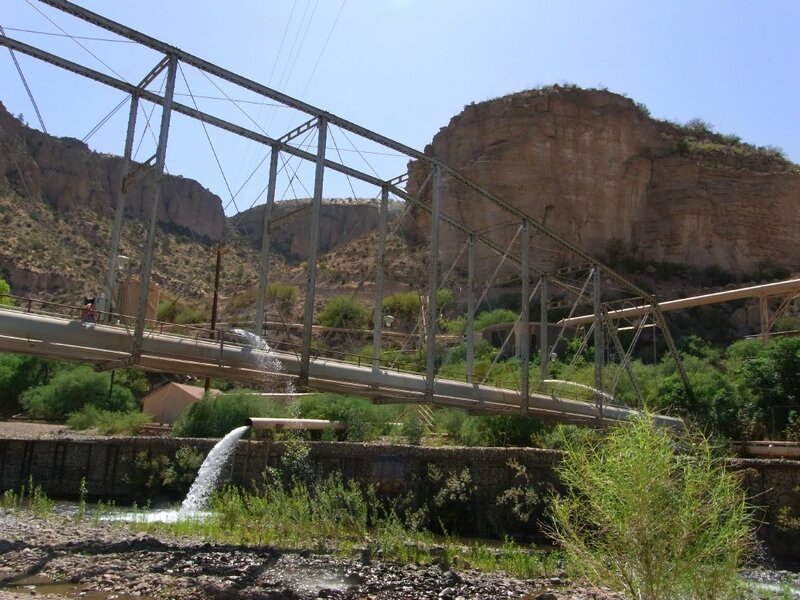 The aqueduct for the Morenci mine pumping station. Locking the hubs as we enter Eagle Creek. 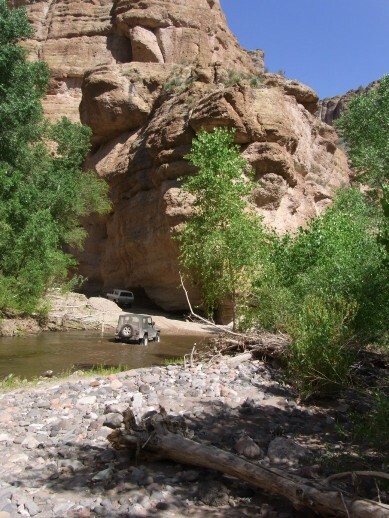 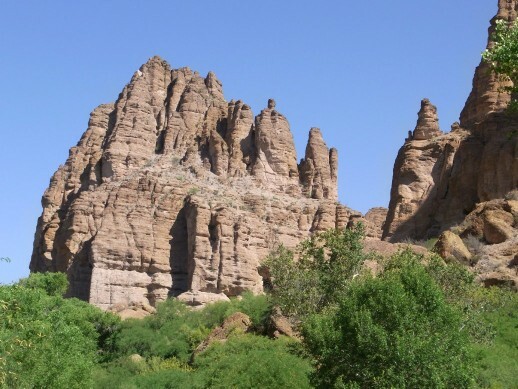 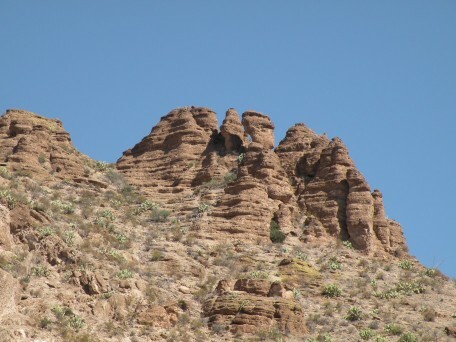 The mouth of Gold Gulch. 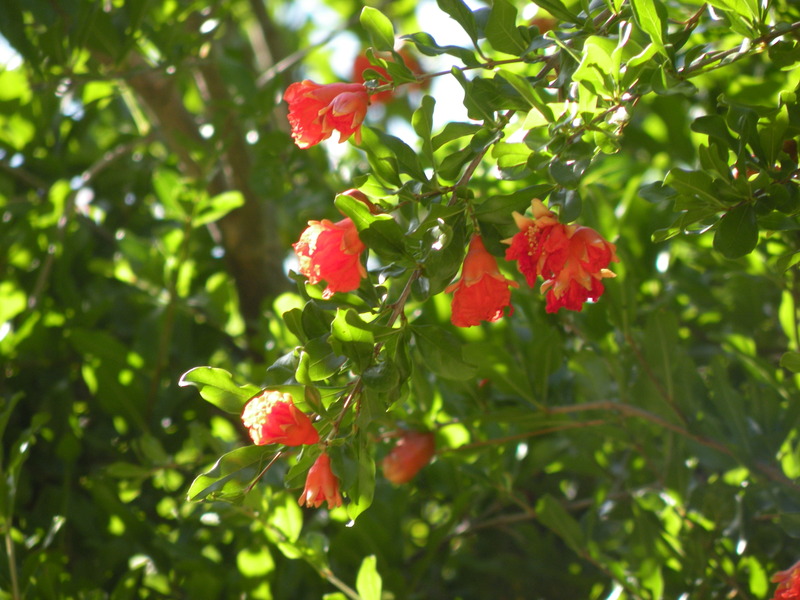 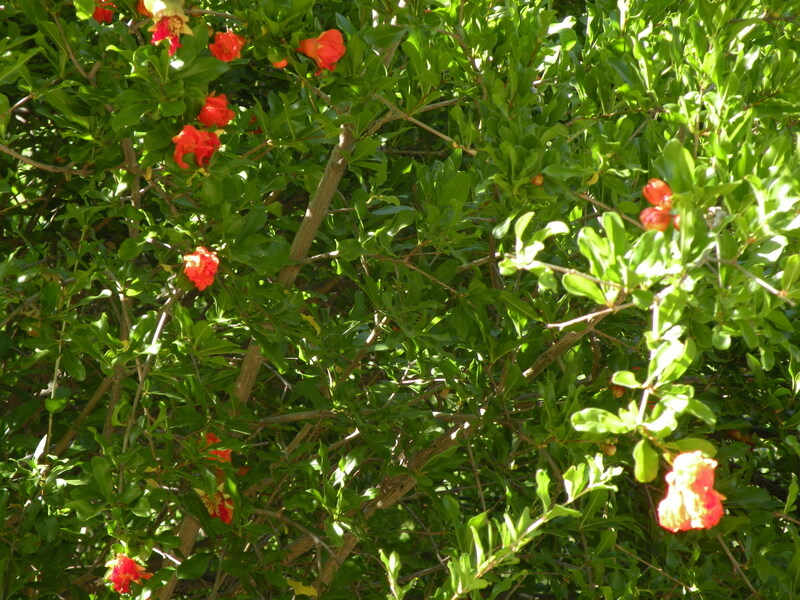 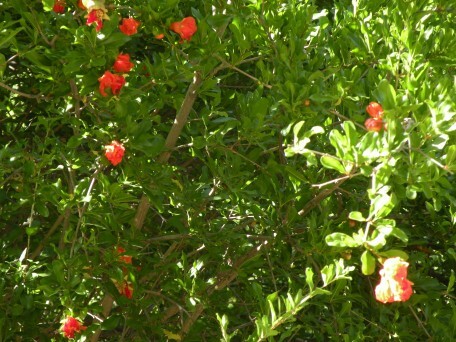 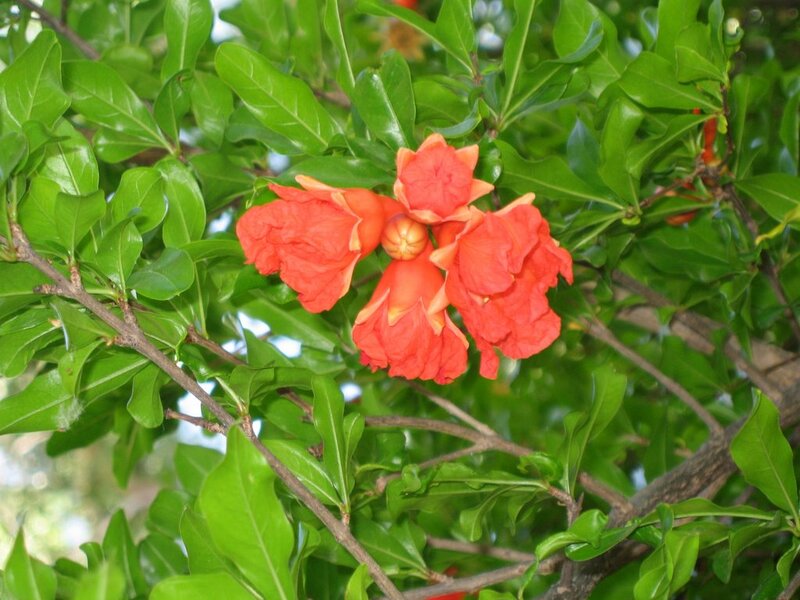 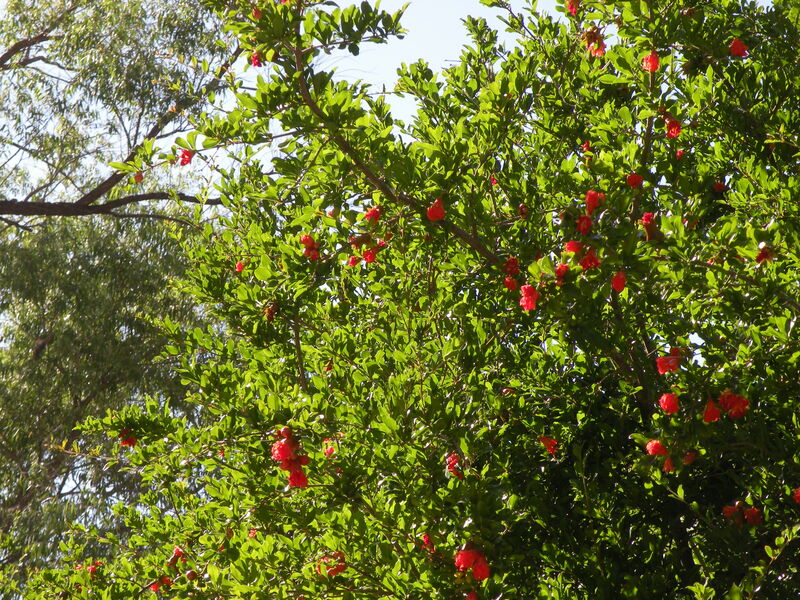 Pomegranate trees at the old homestead site. 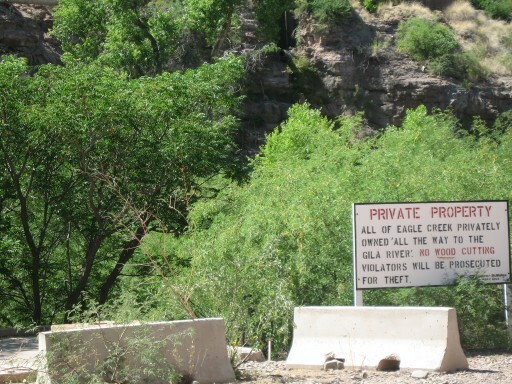 The entrance to Thursday night's camp - this should keep the RVs out. Click to see the movie (29.0 MB). 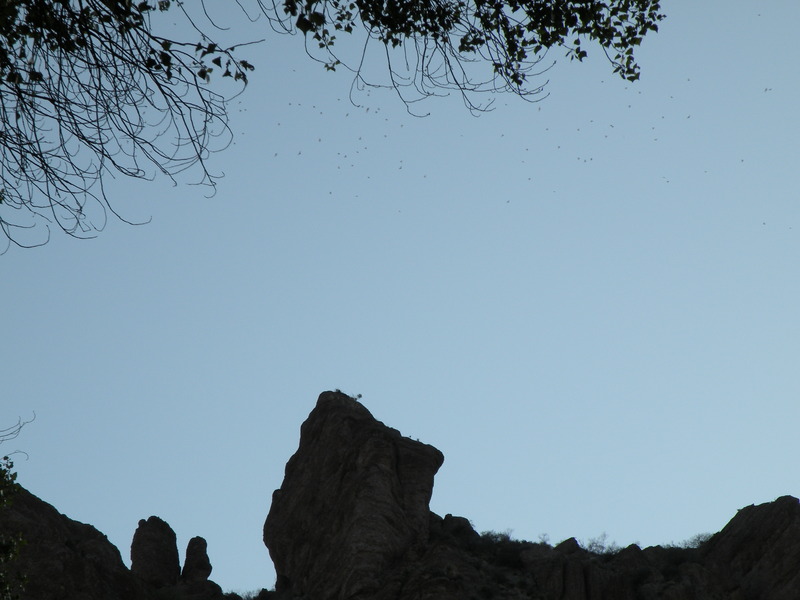 Click to see another movie (34.6 MB). Relaxing in camp near the Bat Cave. 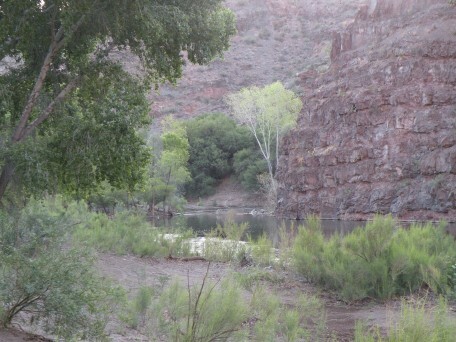 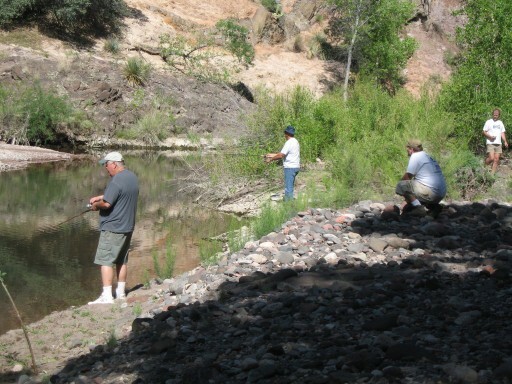 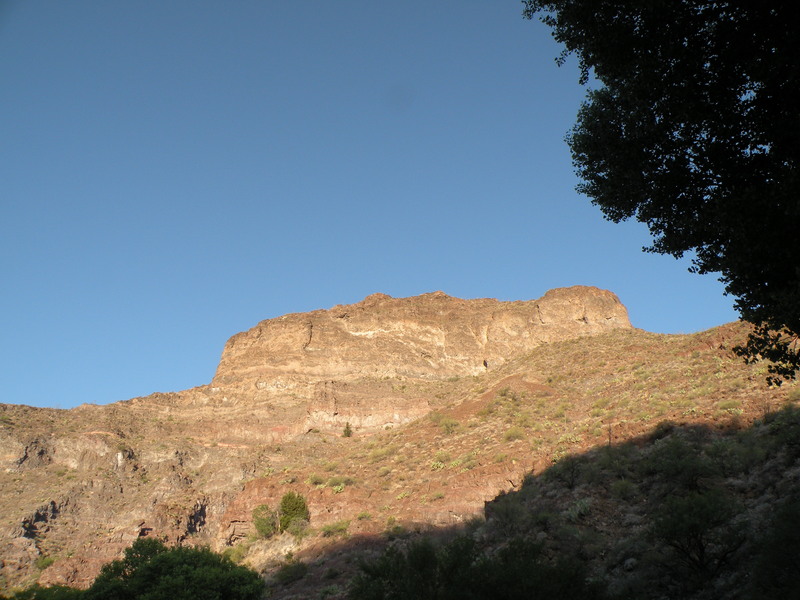 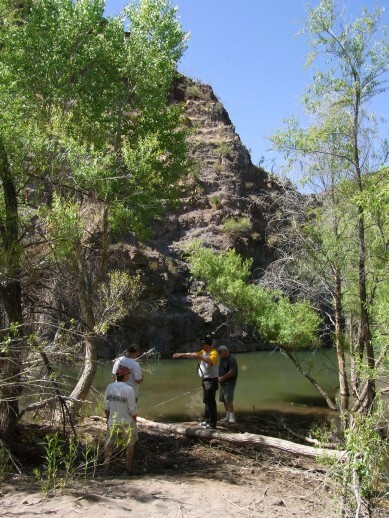 We headed down canyon about 8AM Friday with a stop for fishing every hour or so whenever we came to a deep pool. 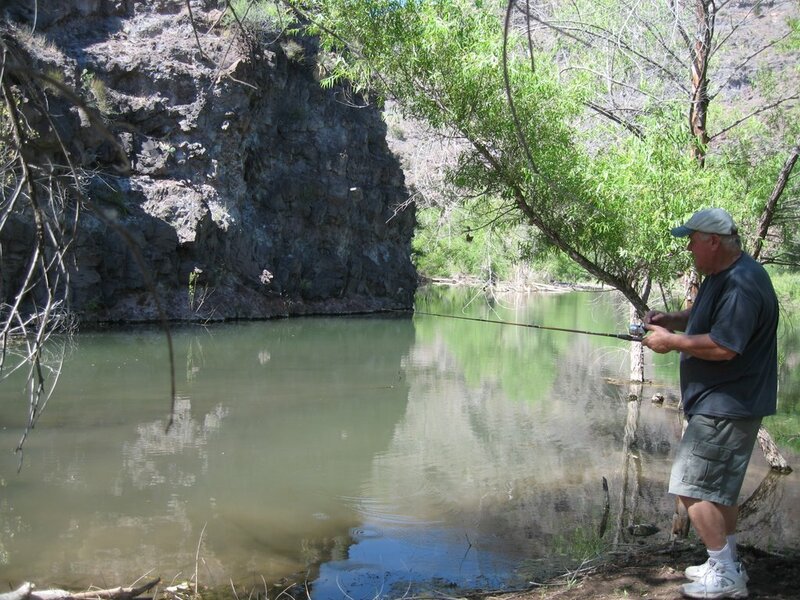 I won't say the fishing was incredible (7 fish total), but Bob had the magic spinner that provided the two bass and one sunfish to make fried fish hors d'oeuvres in the evening. 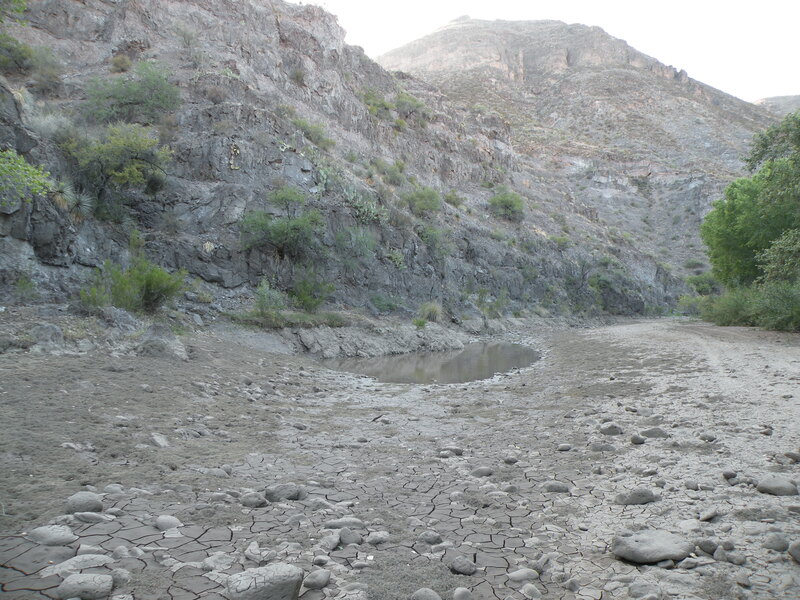 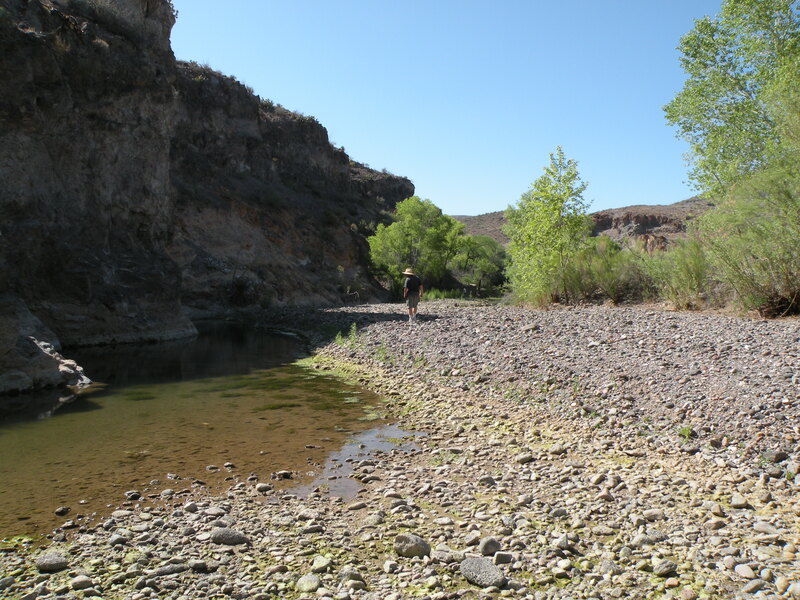 The water was remarkably low, so we made rapid progress downstream. A beaver dam and one other washout still provided two stream crossings that were 35-inches deep. We had to cut fallen trees in a number of places along the way to clear the trail. 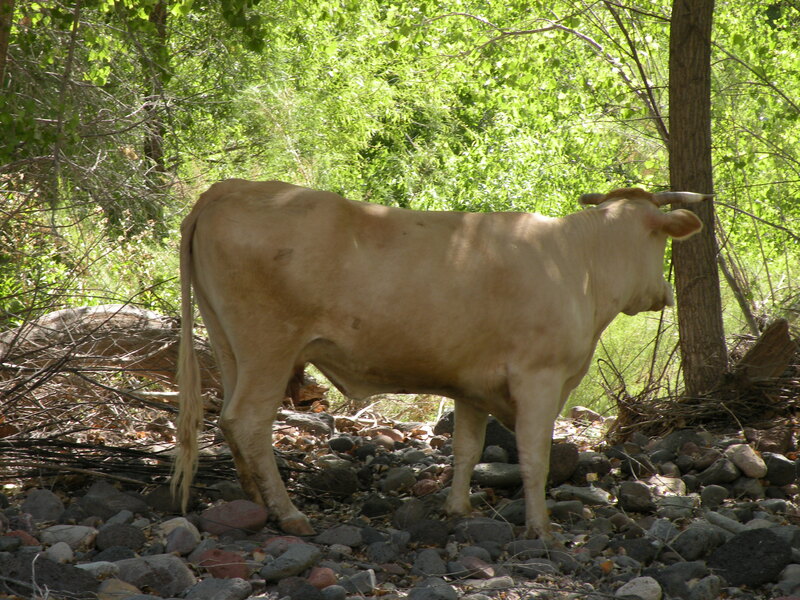 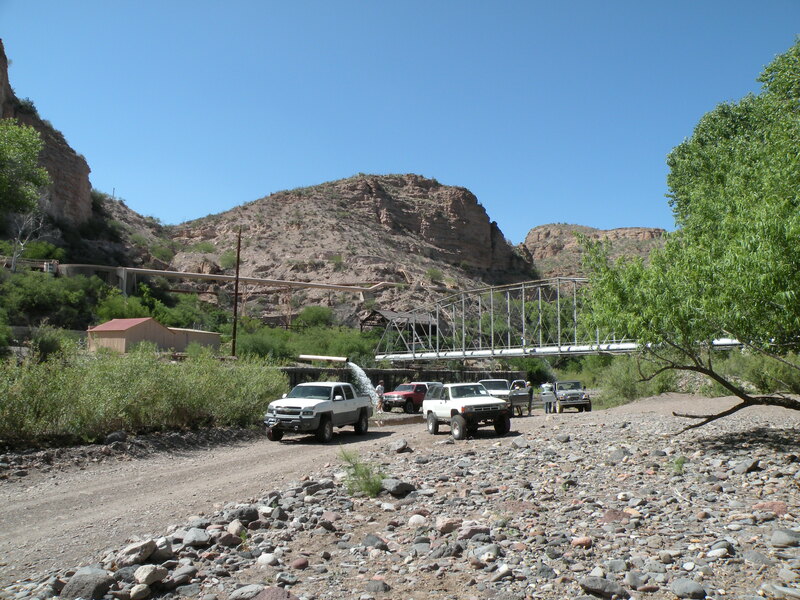 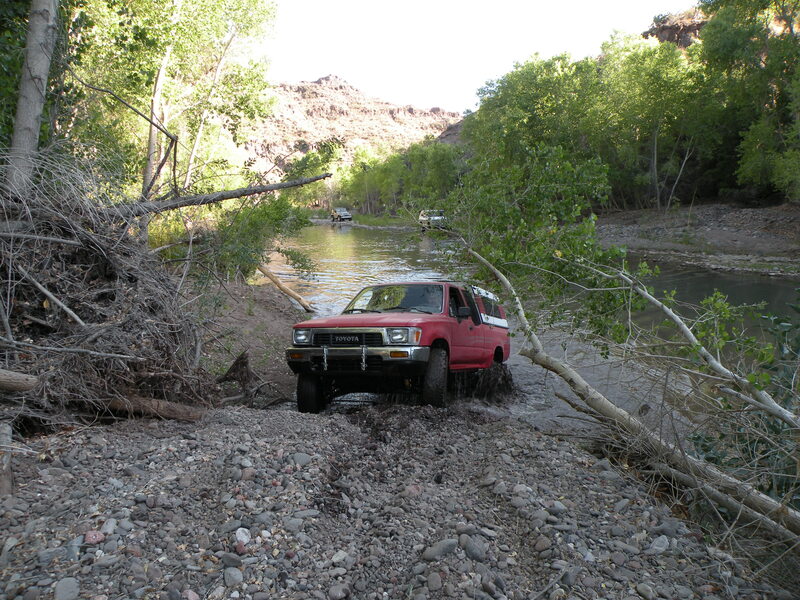 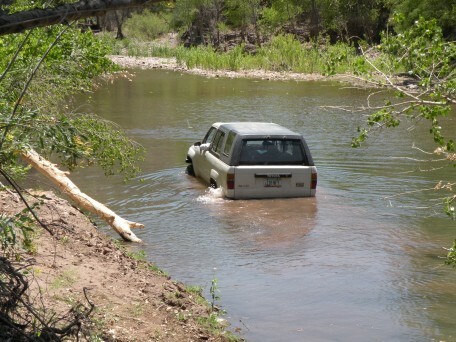 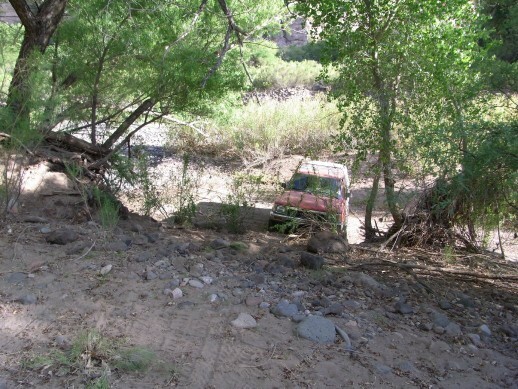 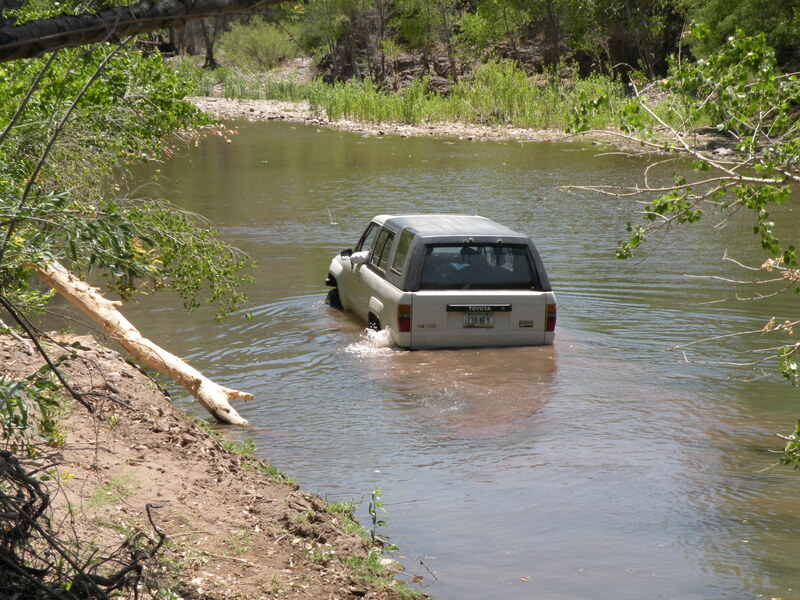 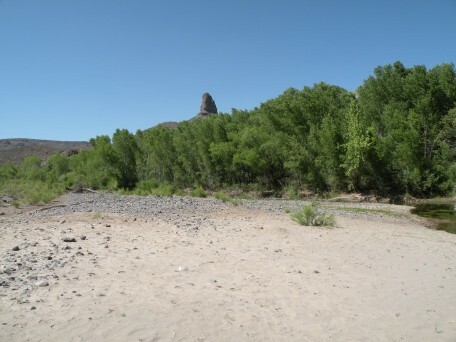 We made it the whole way to the confluence of the Gila River by mid-afternoon. 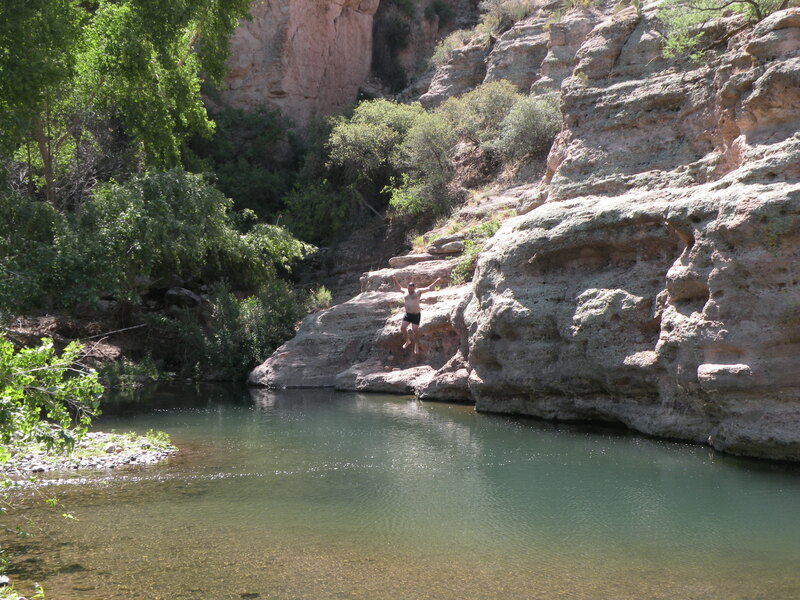 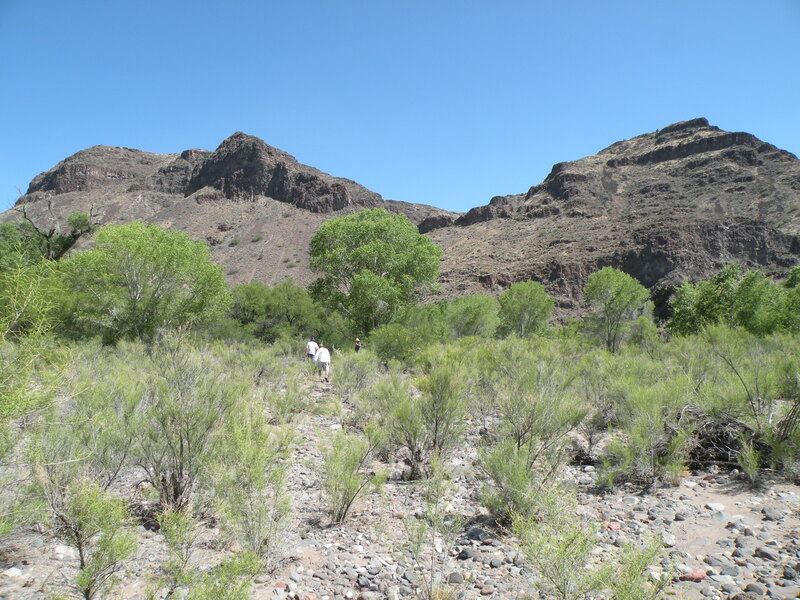 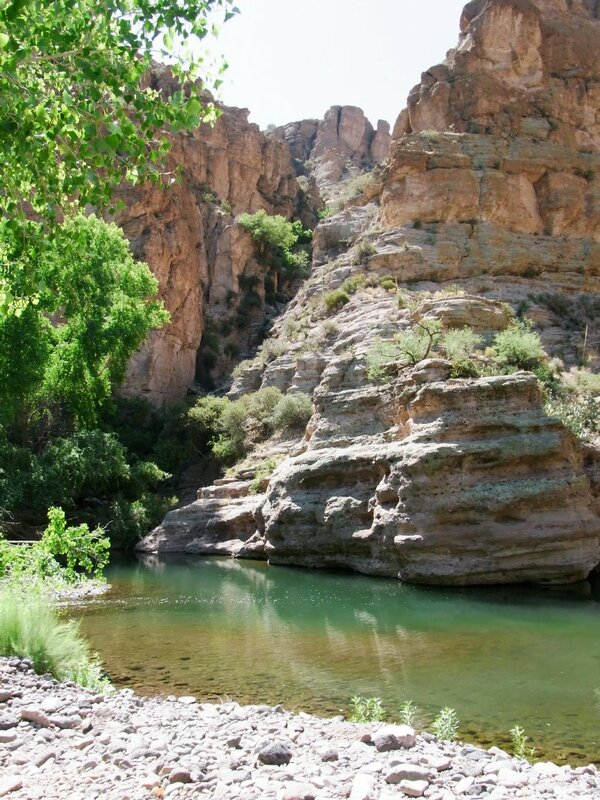 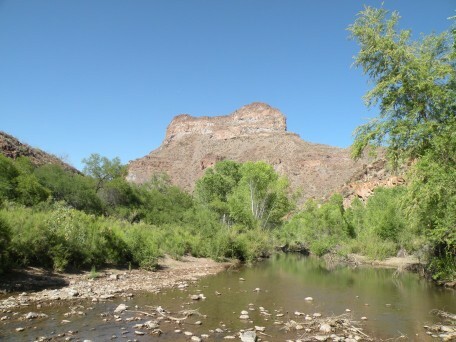 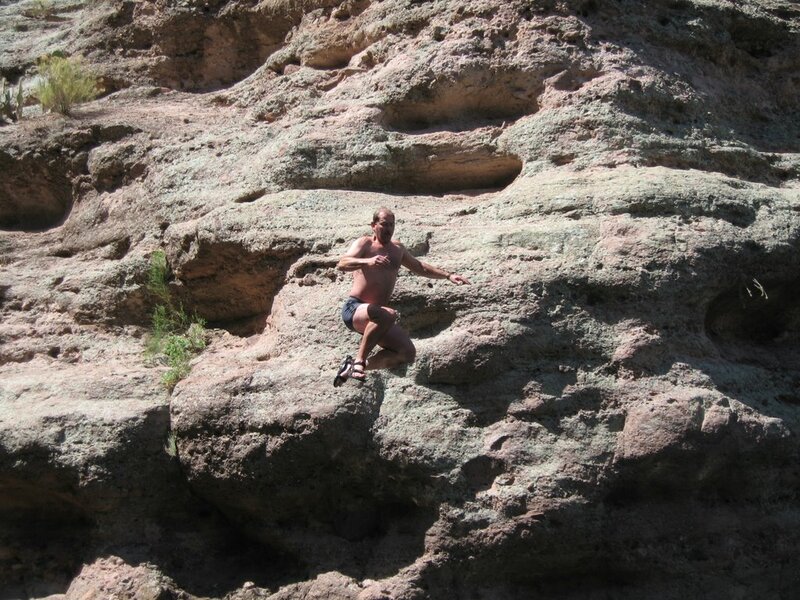 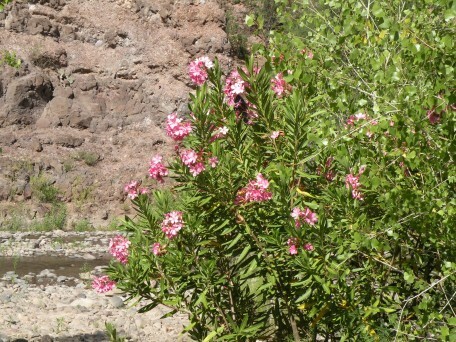 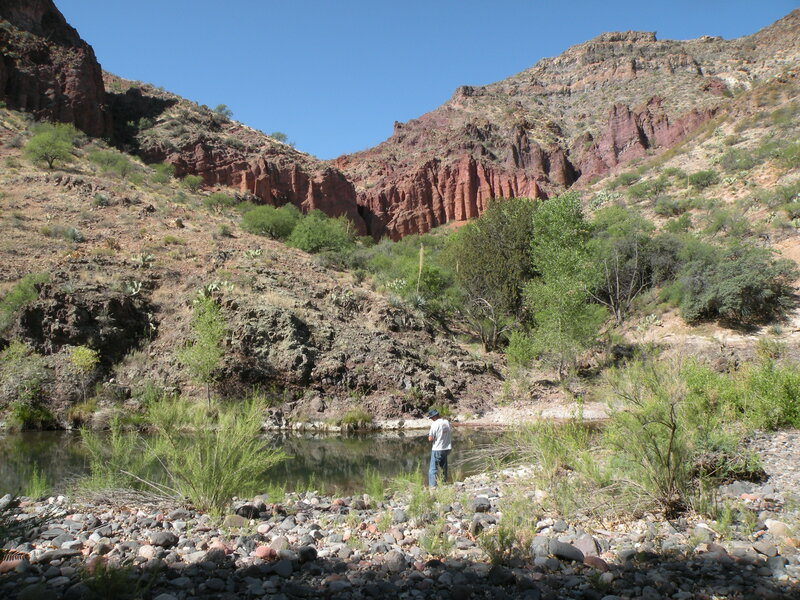 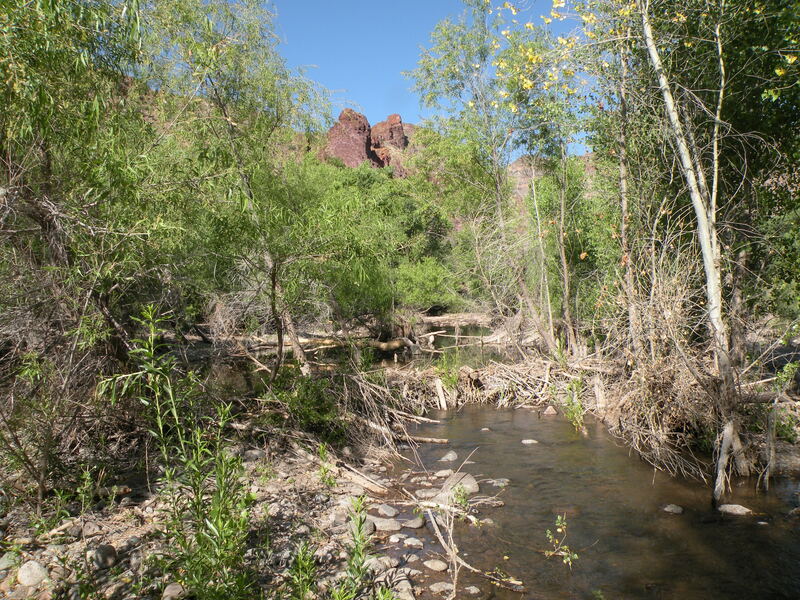 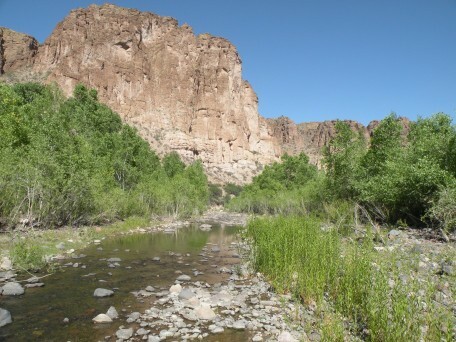 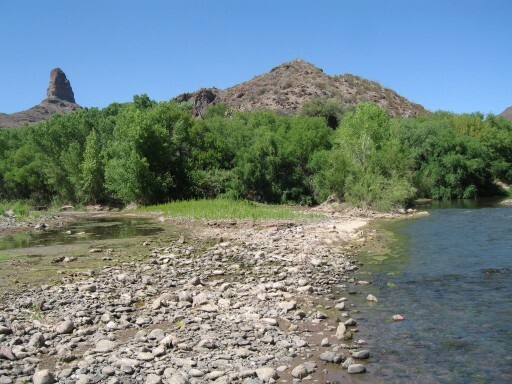 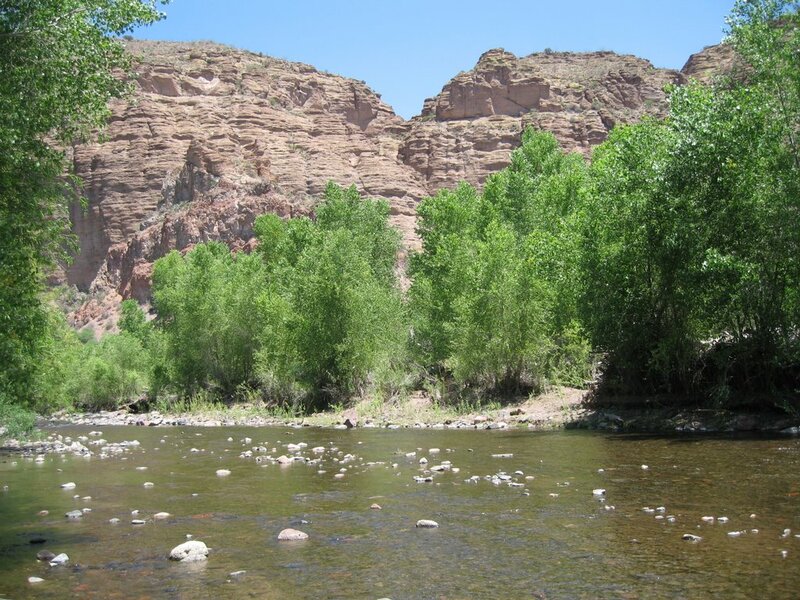 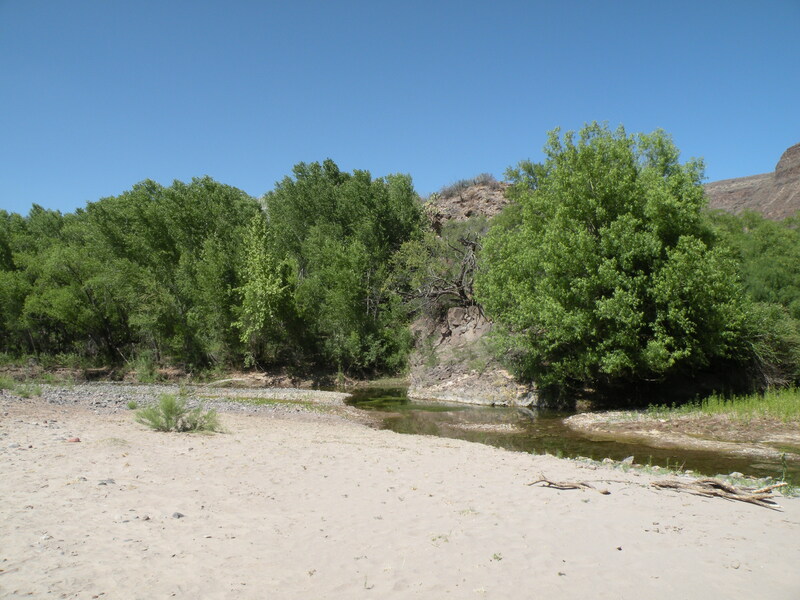 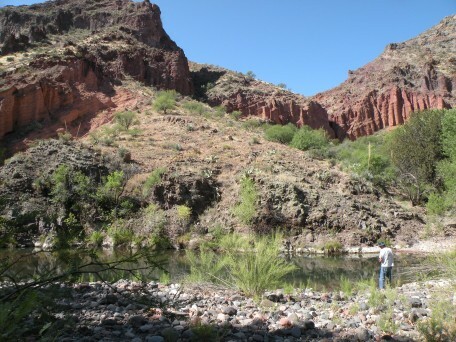 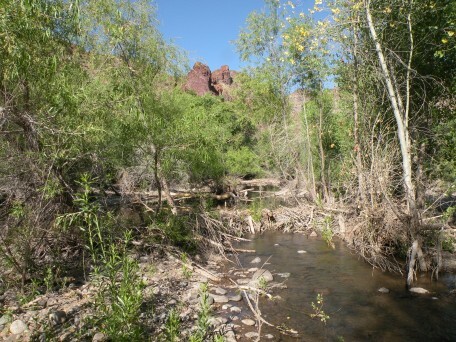 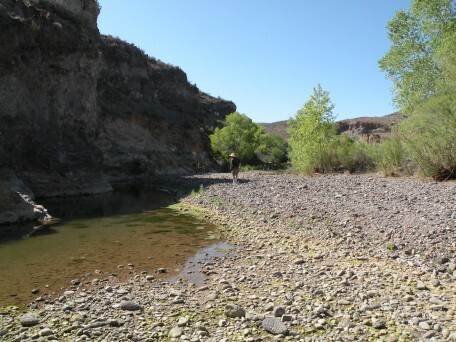 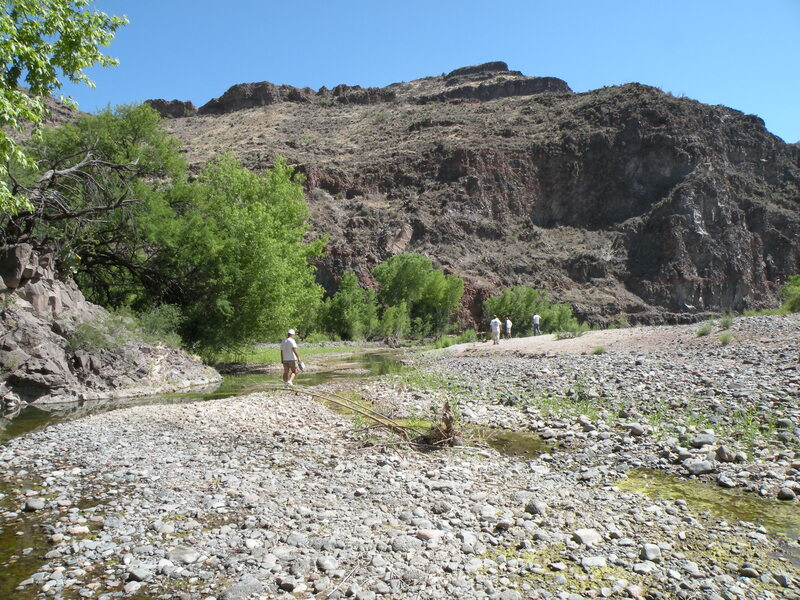 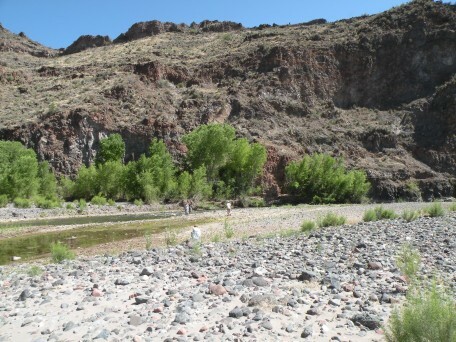 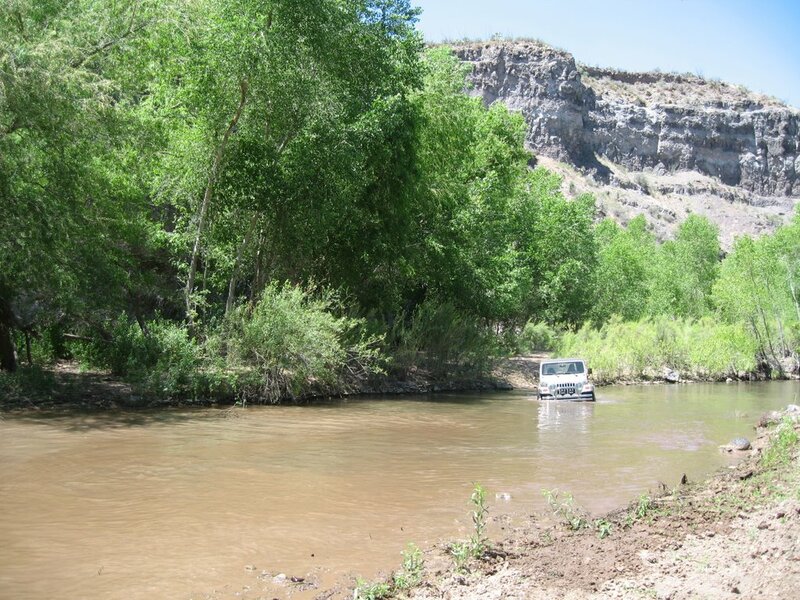 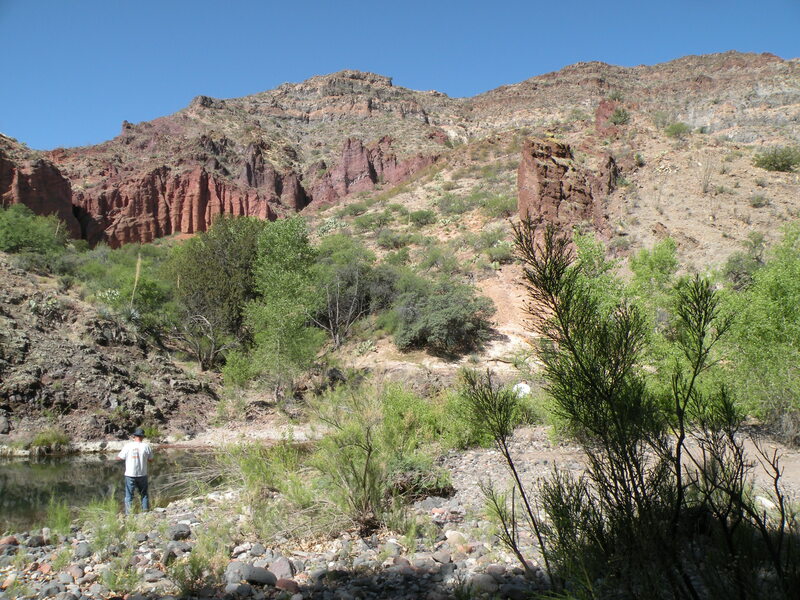 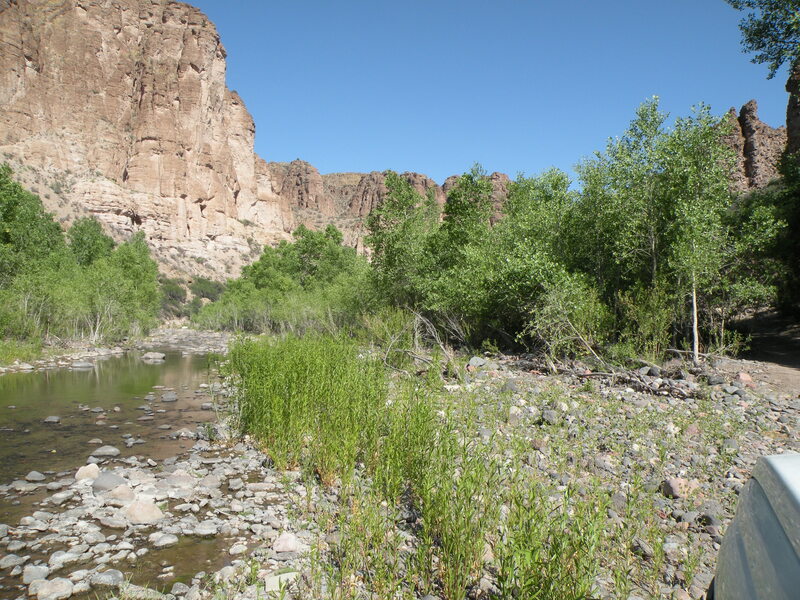 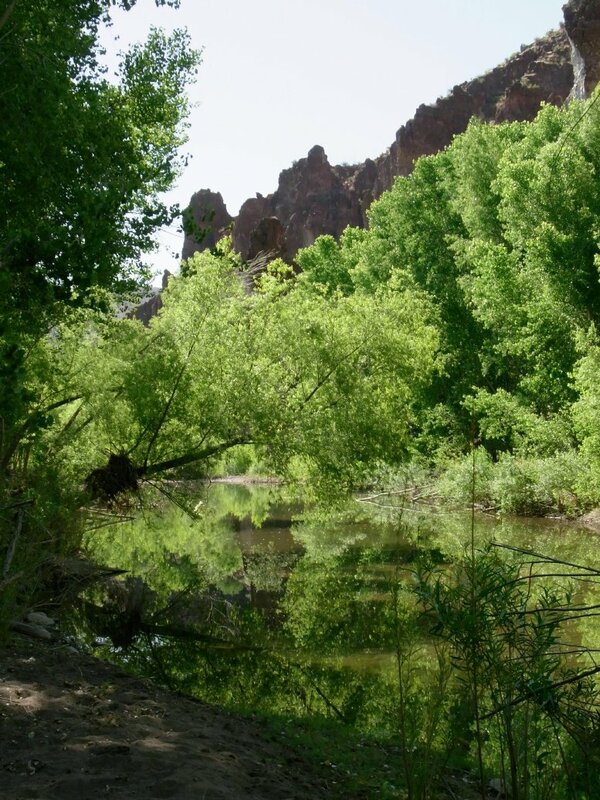 After hiking the last quarter mile, we celebrated with a swim in the rarely-this-clear-running Gila at 81.5 degF. 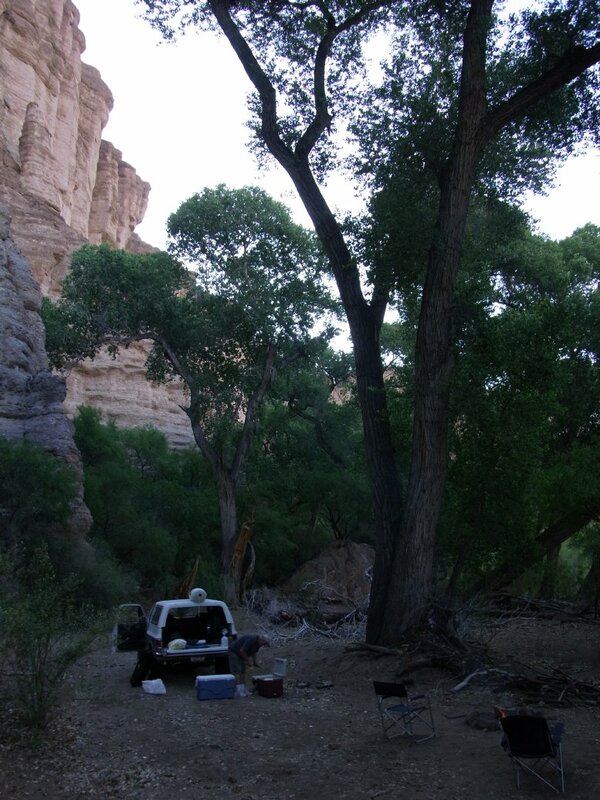 We headed back upstream about 3 miles before selecting another well-shaded campsite next to the big beaver pond for the night. 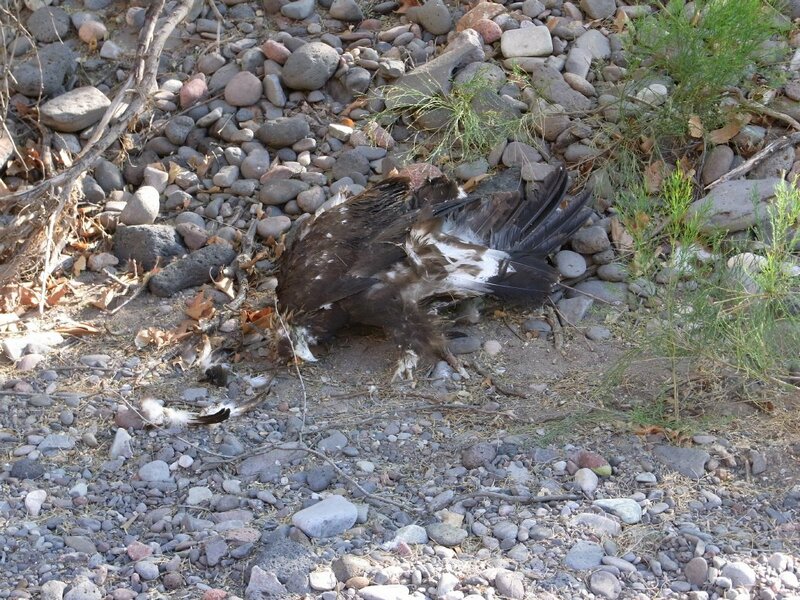 We found a dead eagle along the way, although there is doubt if we ever saw a live eagle. We saw plenty of vultures, ravens, hawks and other birds. 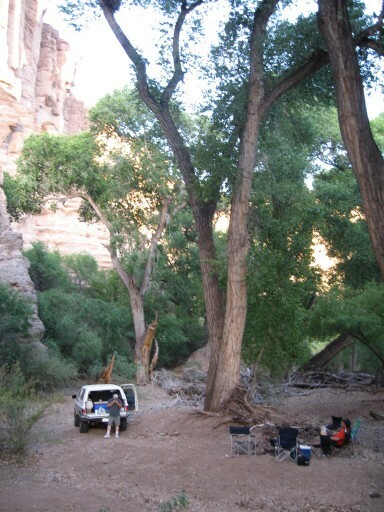 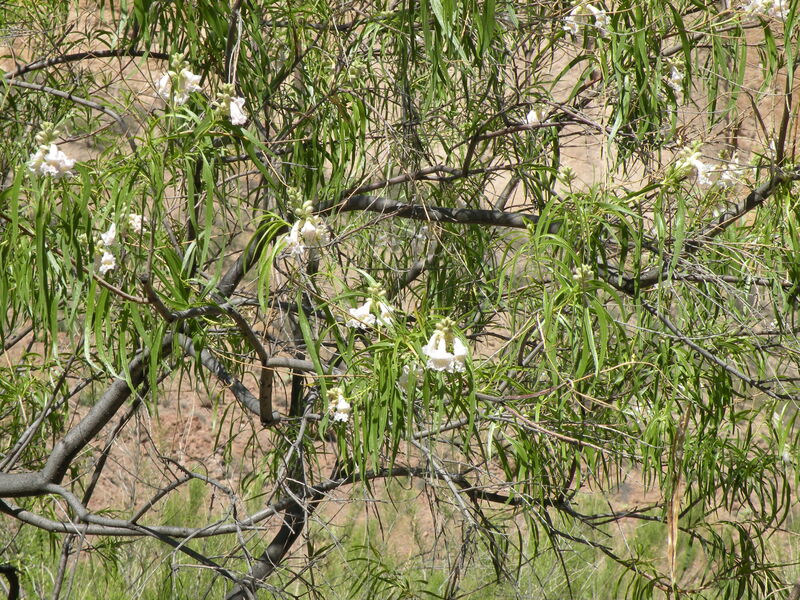 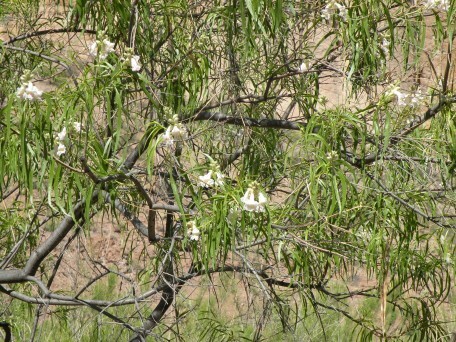 We did not see any bighorn sheep on this trip - perhaps because the cottonwoods and sycamores were in full leaf. 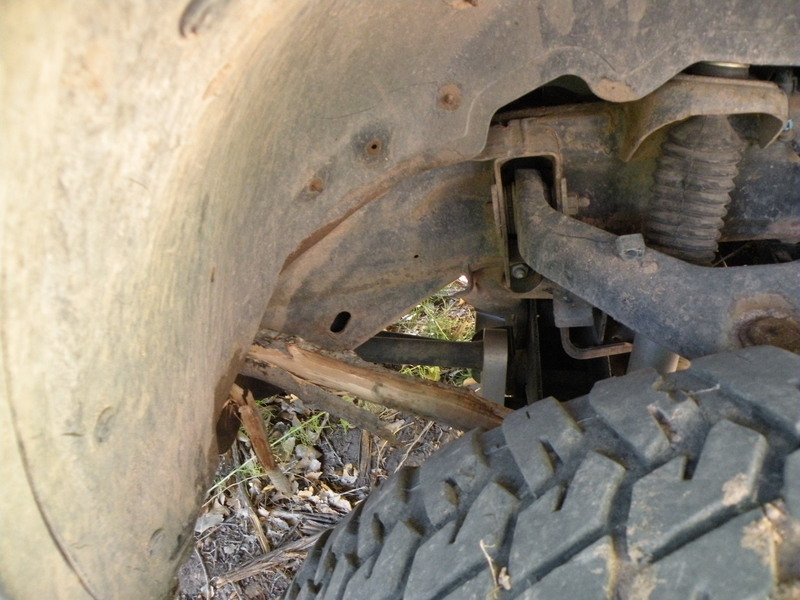 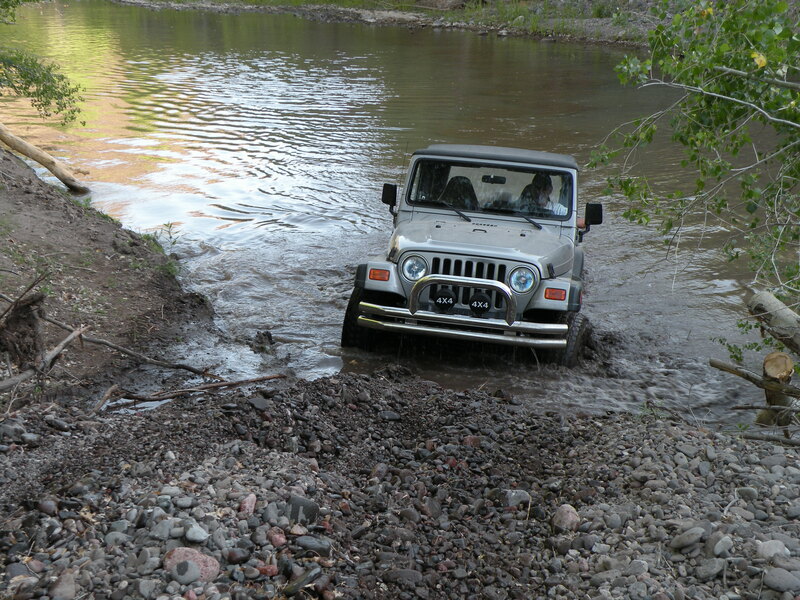 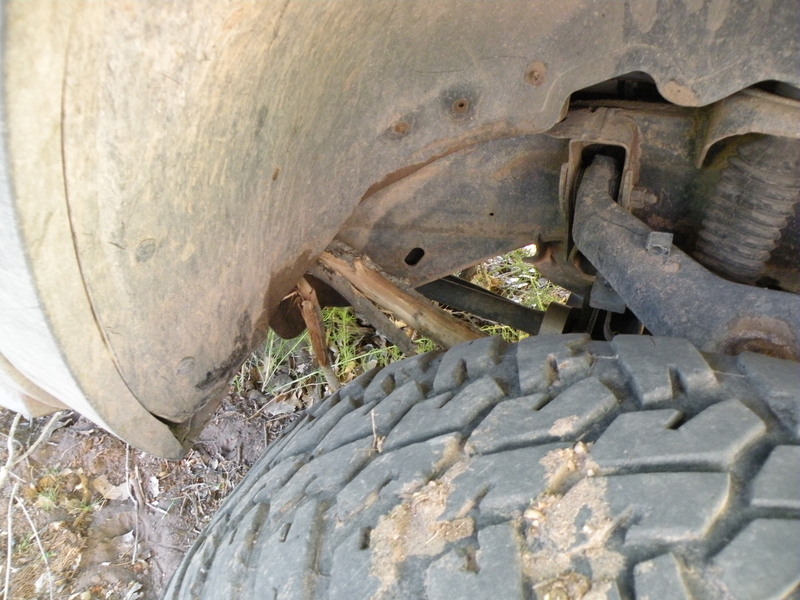 Rex impressed us with the ability of his open-diff TJ (w/ swaybar disconnected) to climb gravel banks. 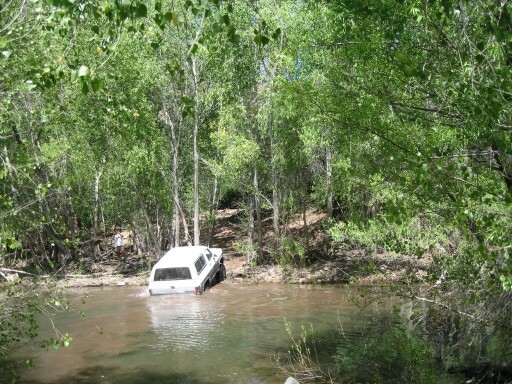 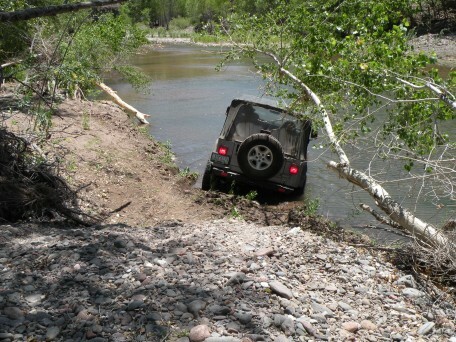 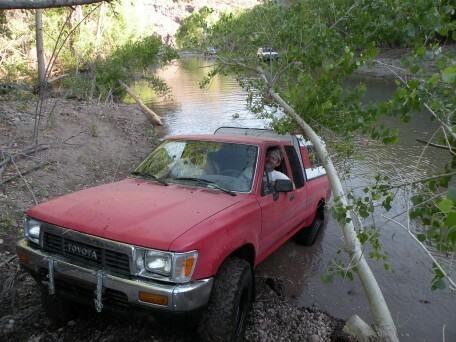 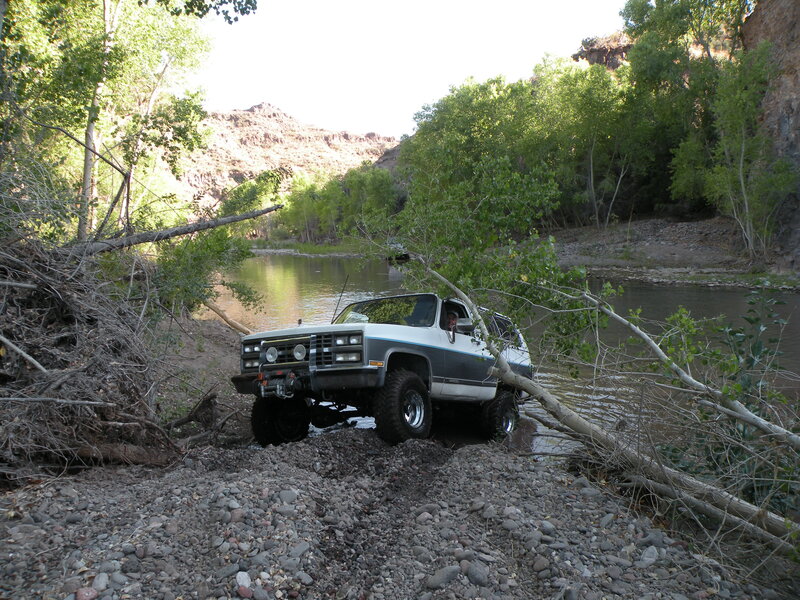 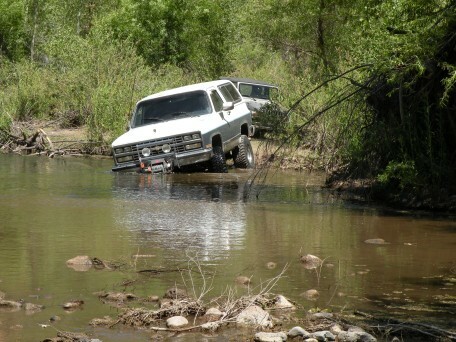 John H. got to use his new winch to get up a steep sandbar. 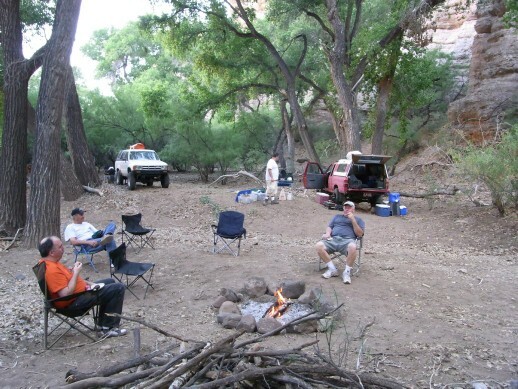 We continued our study of how to use copper wire to make the campfire turn blue. 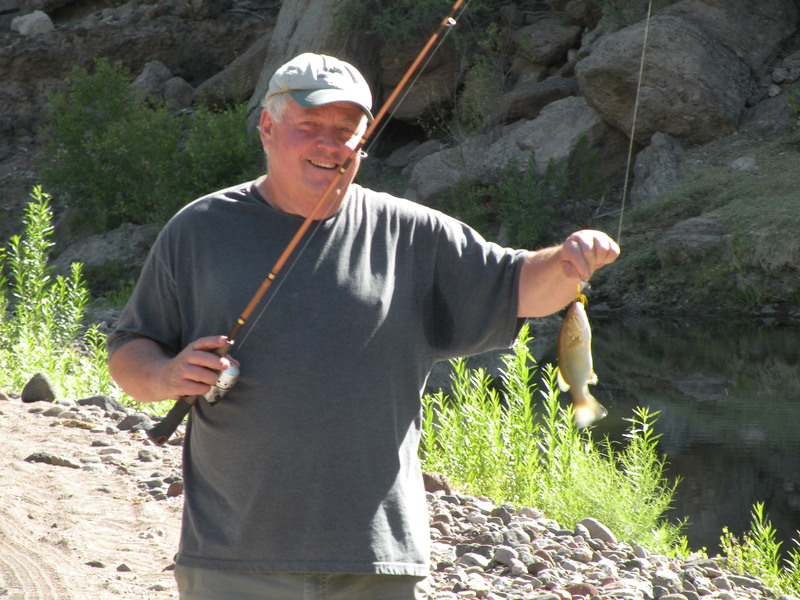 Bob with the first smallmouth bass. The beaver dam here provided a 3-foot deep crossing - the deepest of the trip. 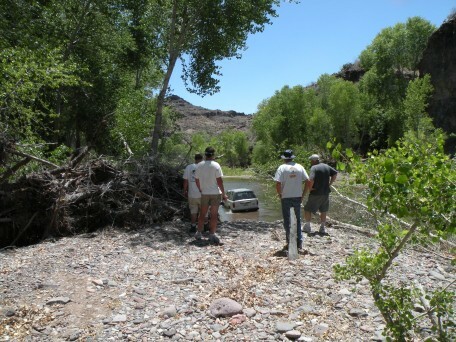 This crossing will be lots more fun coming upstream when we have to climb the gravel bar. 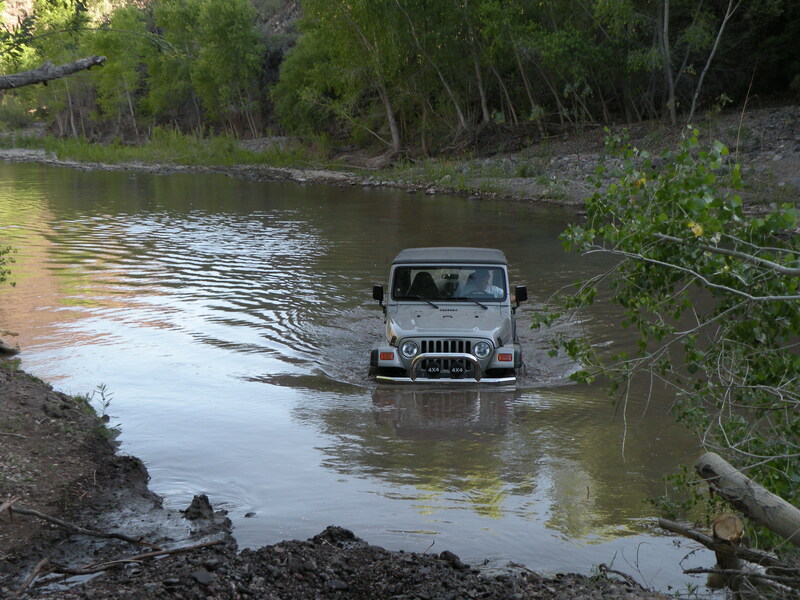 The crossing is wide, but not all that deep. 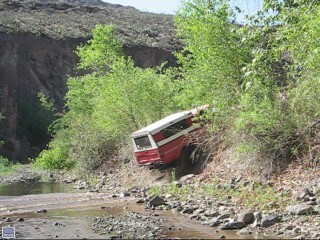 The tricky part is sliding in the mud on the approach. 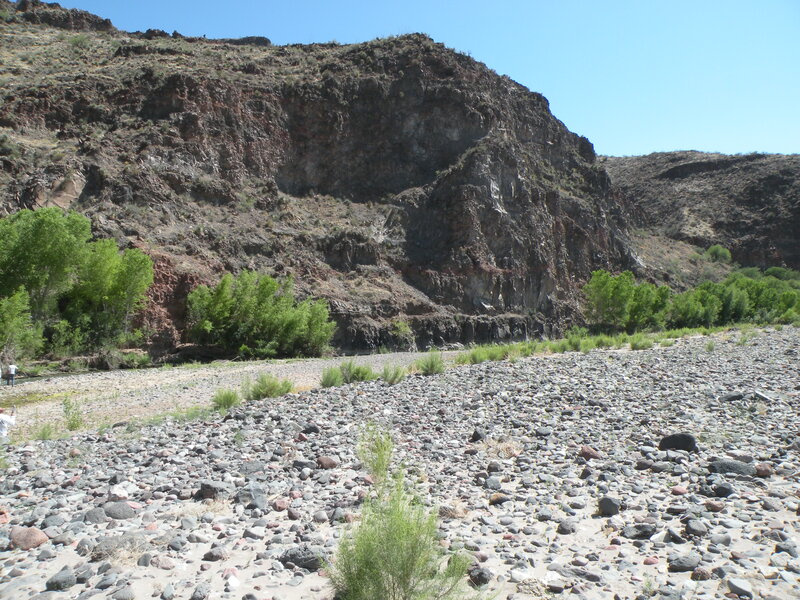 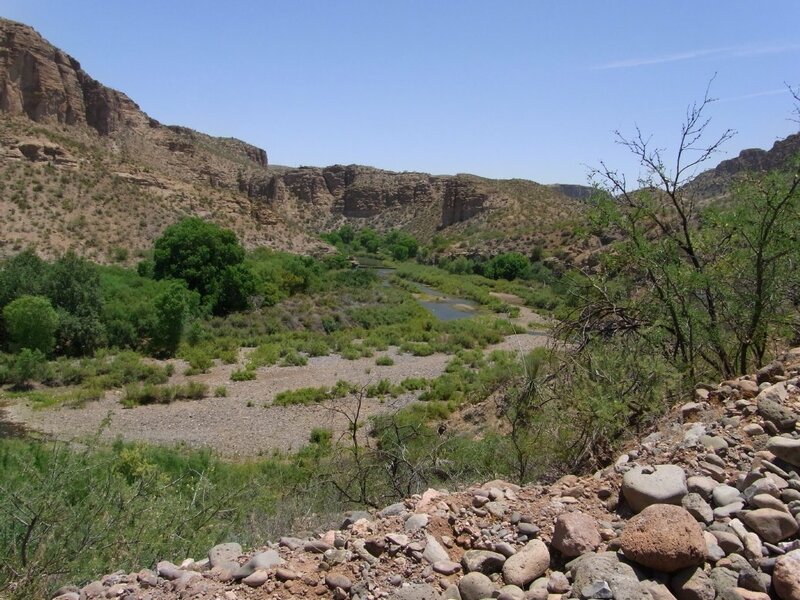 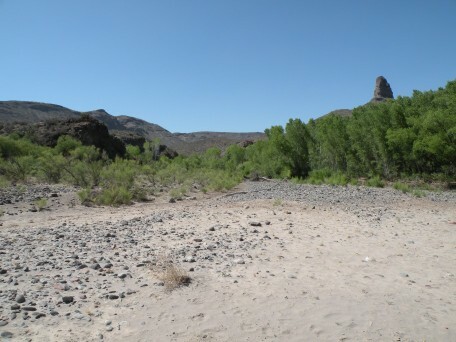 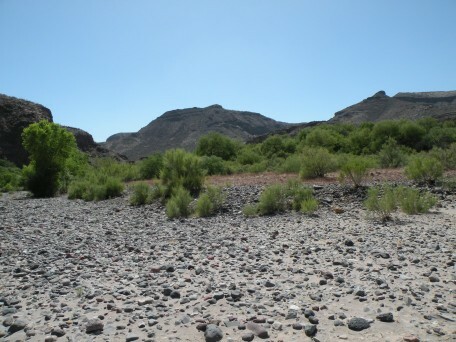 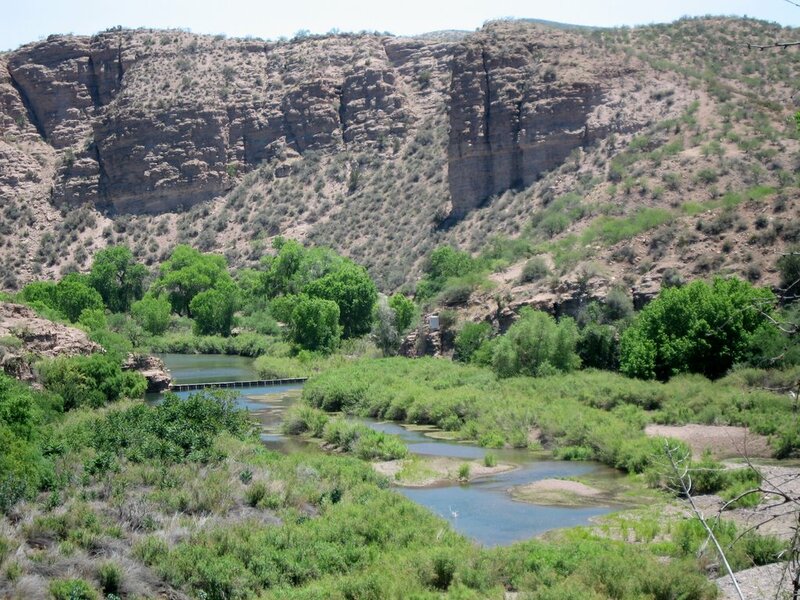 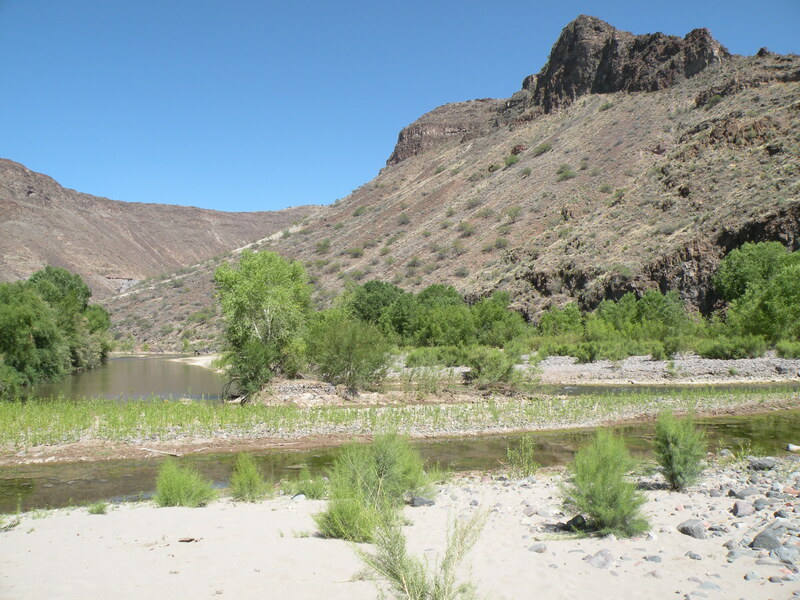 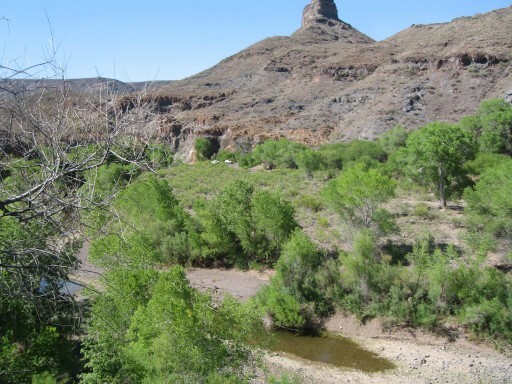 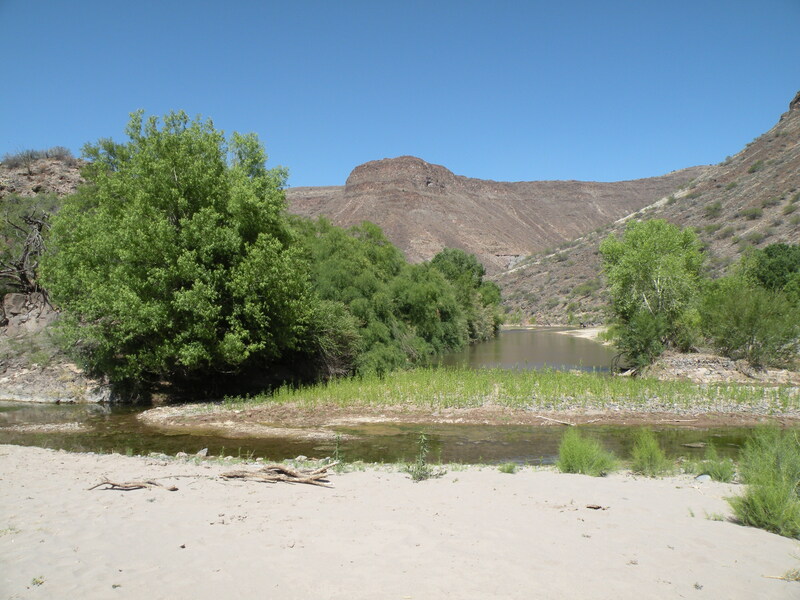 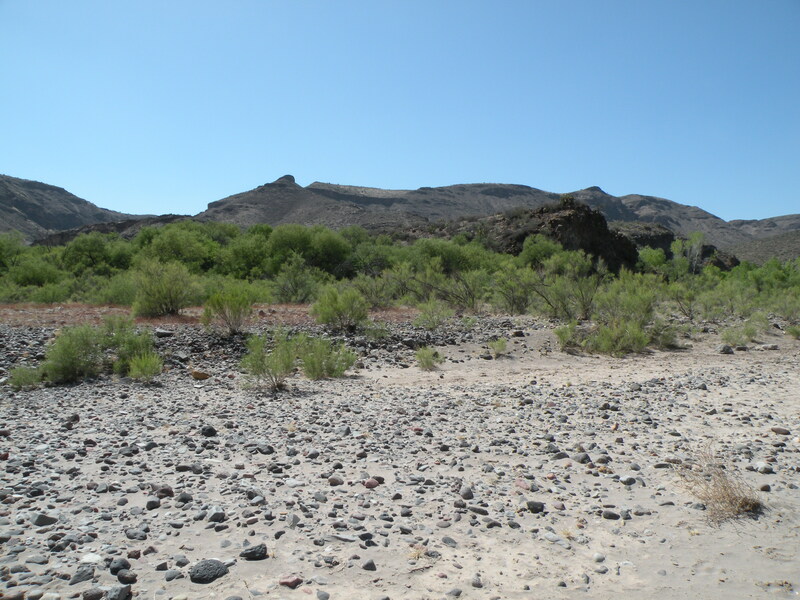 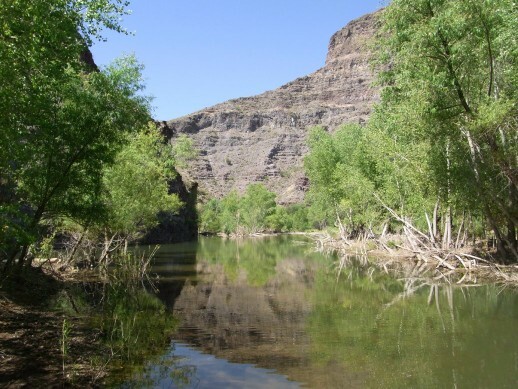 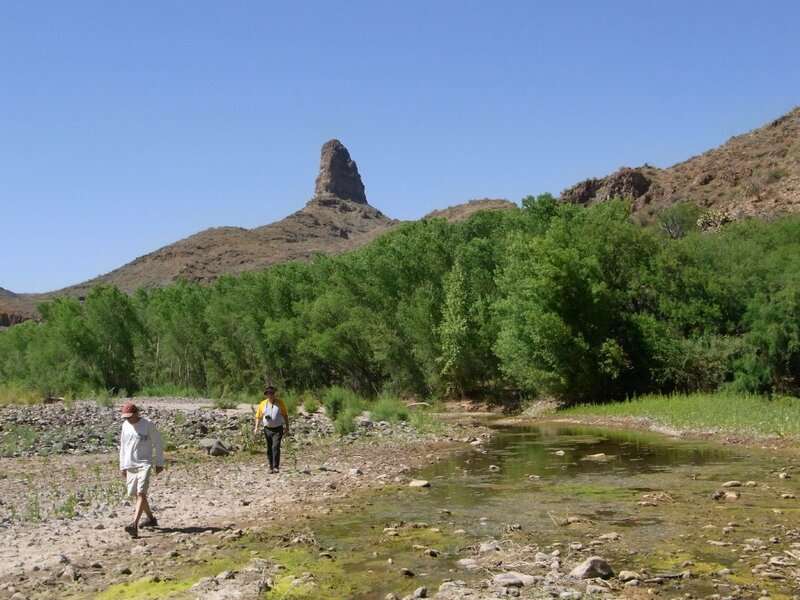 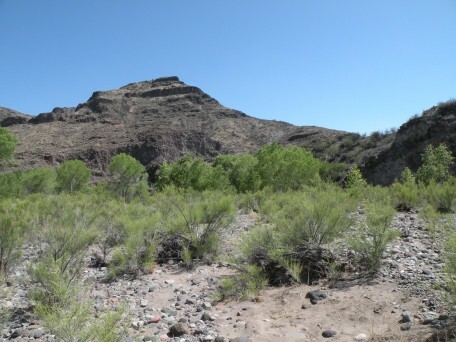 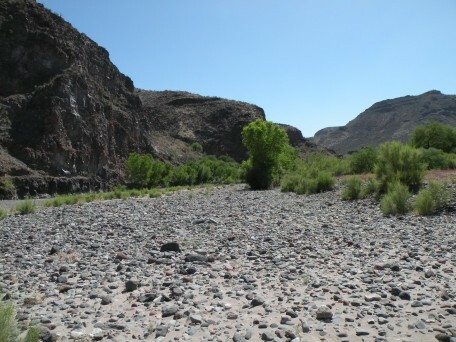 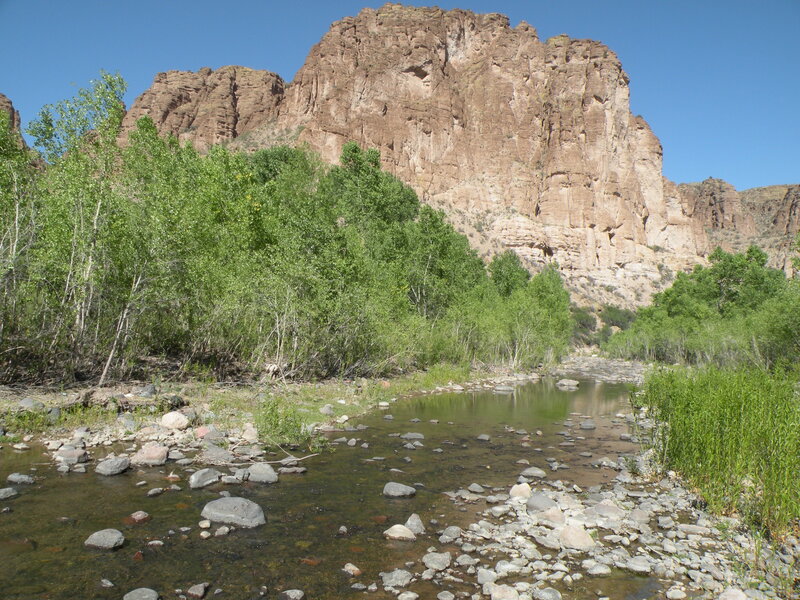 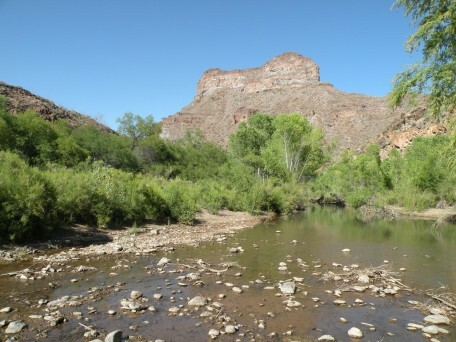 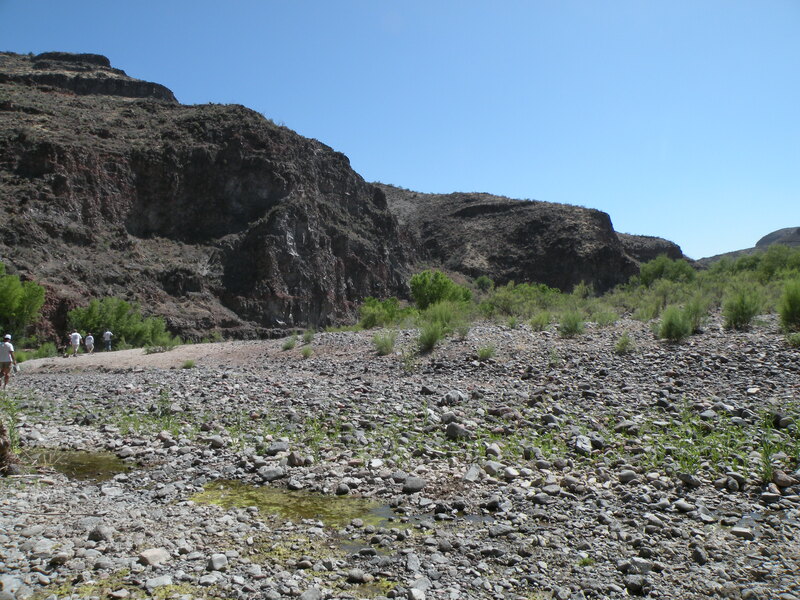 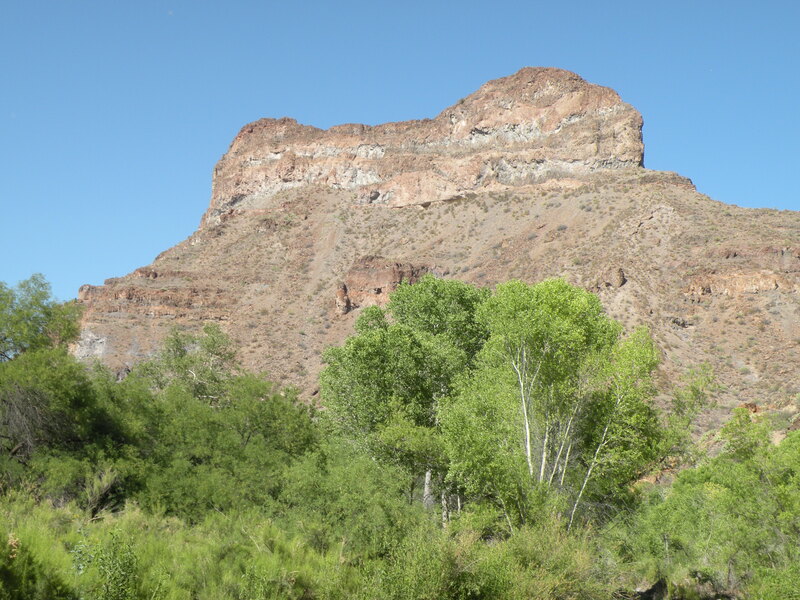 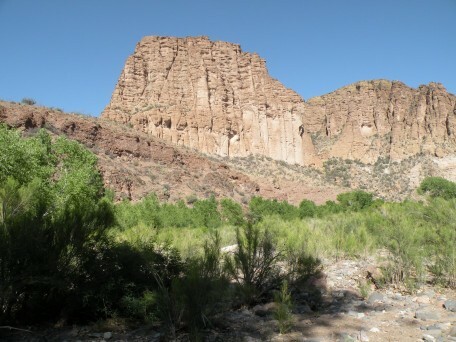 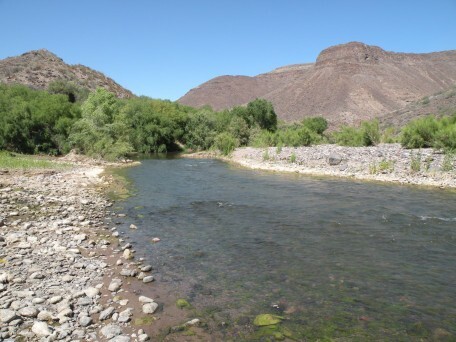 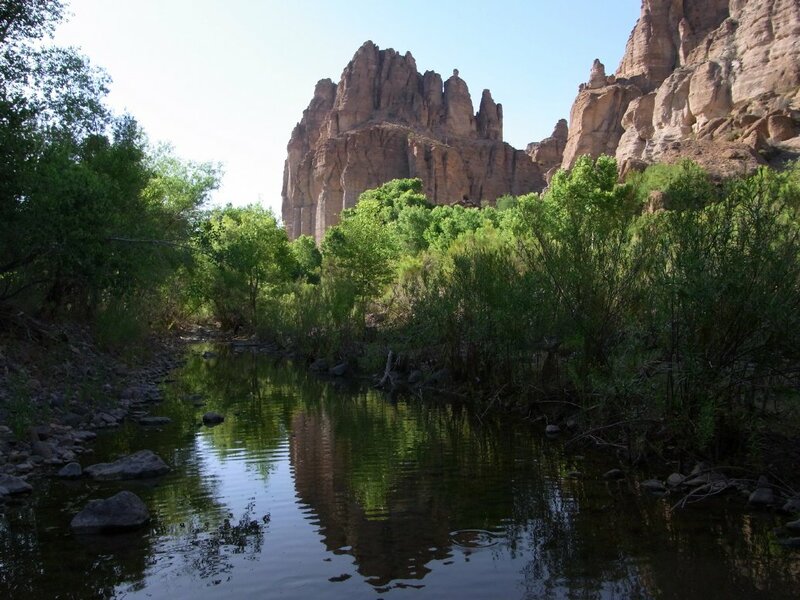 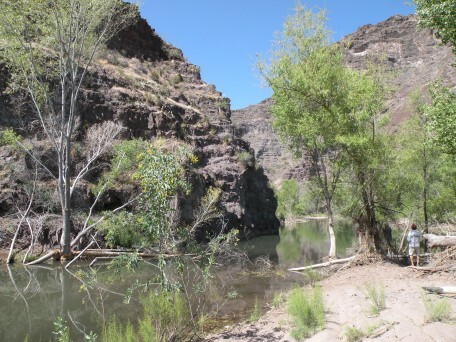 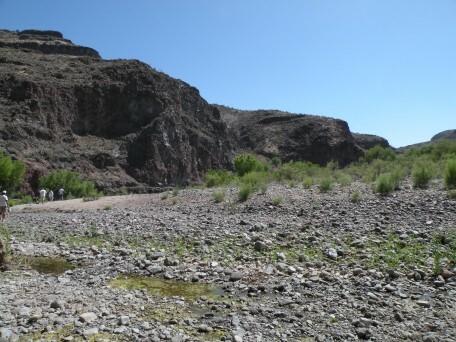 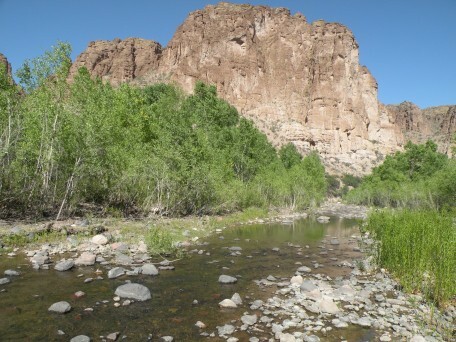 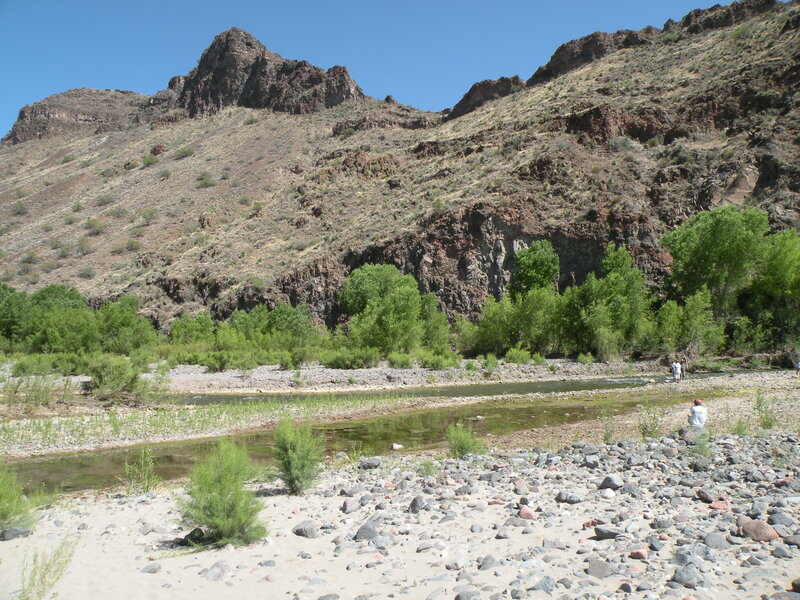 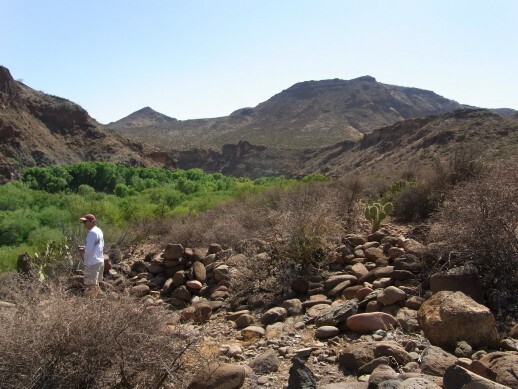 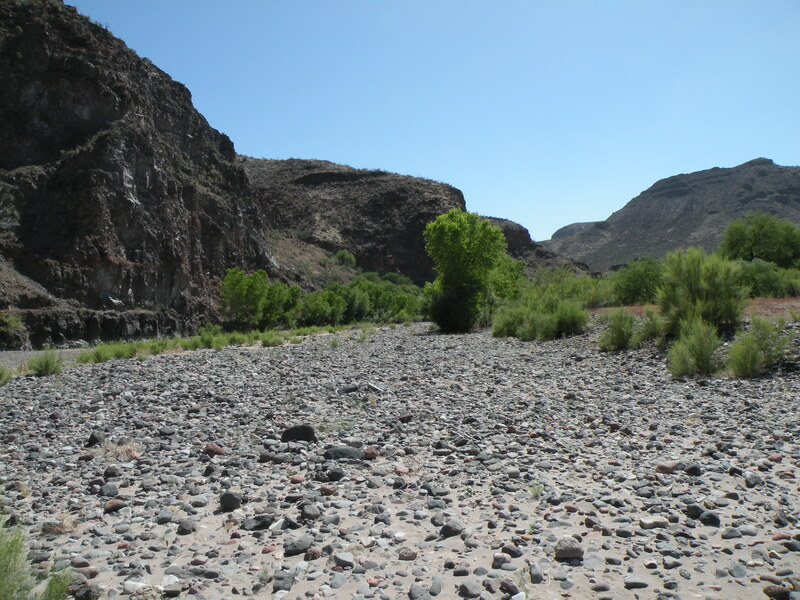 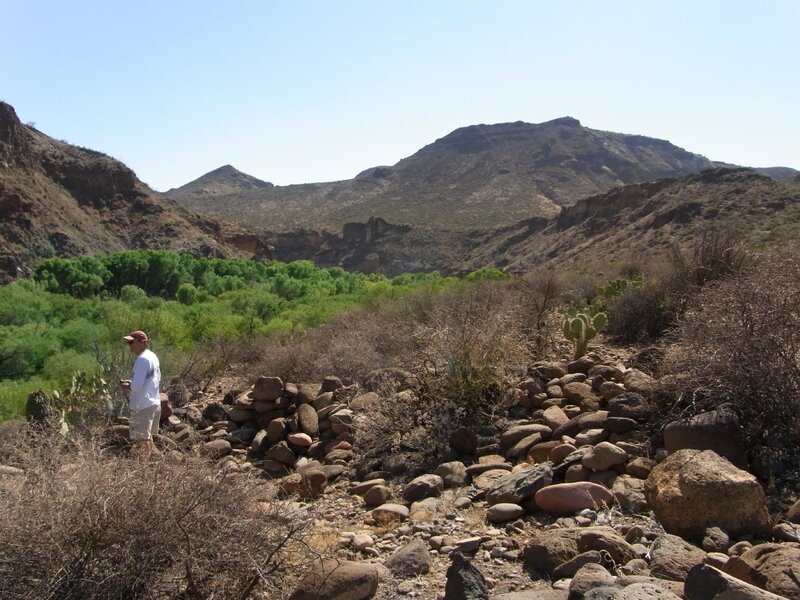 Confluence of Eagle Creek and the Gila River. Toyota with open-diffs gets the strap. 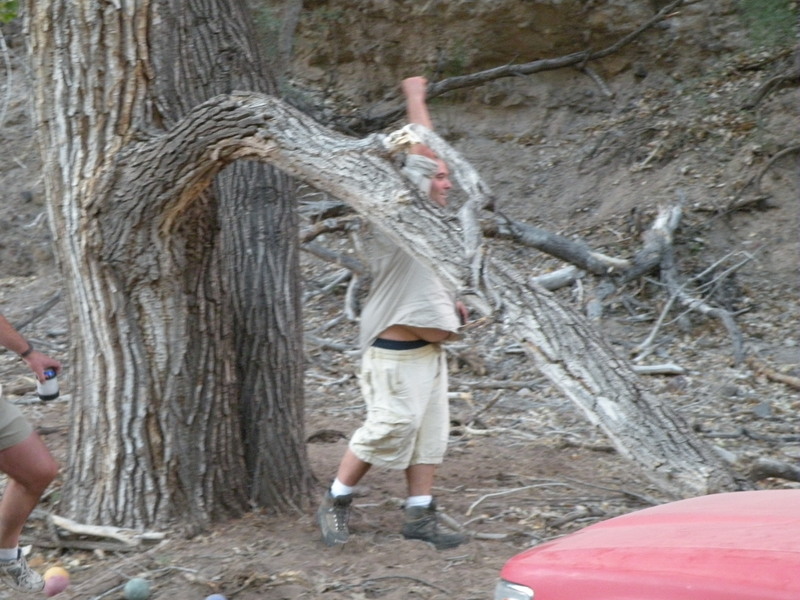 Trimming the tree to make room for the Blazer. 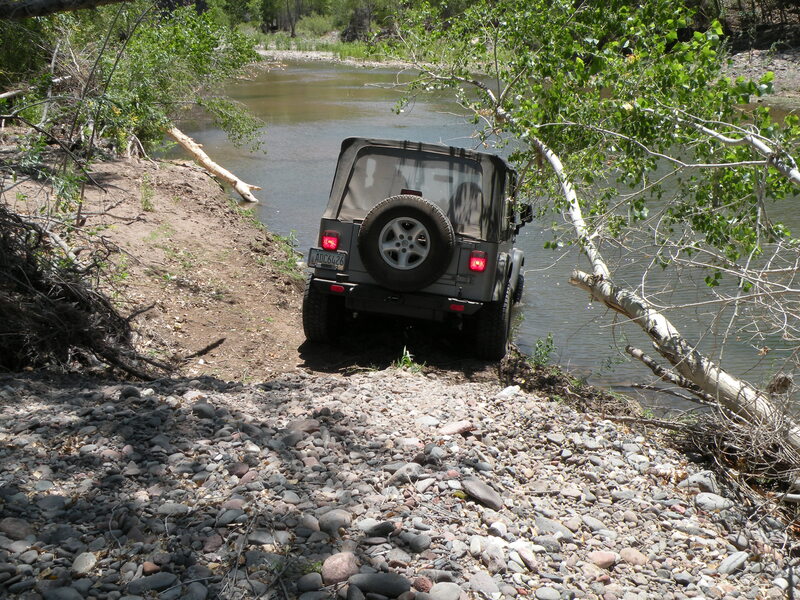 Rex was able to climb this gravel bank even without lockers. Click to see the movie (34.3 MB). 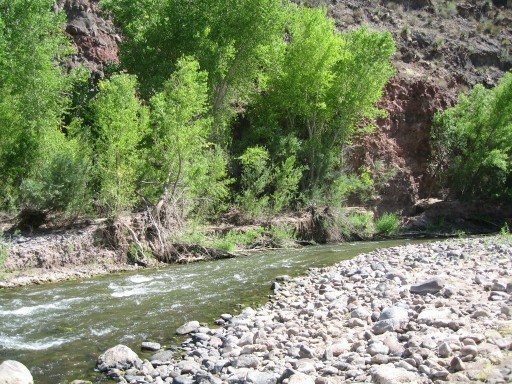 Rapids in the Gila River. 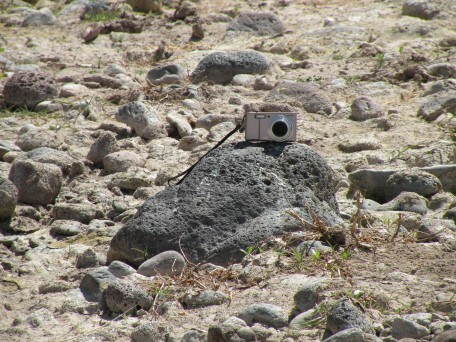 Click to see the movie (1.9 MB). 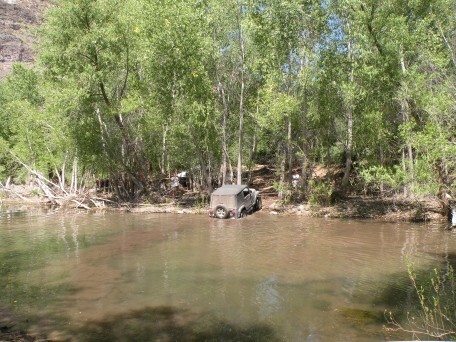 One of several fishing holes. Big pool at the beaver dam. 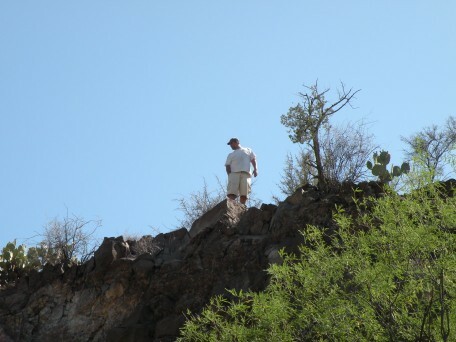 Thanks to Karl who waded across to check the depth, and who recorded all 5 movies. 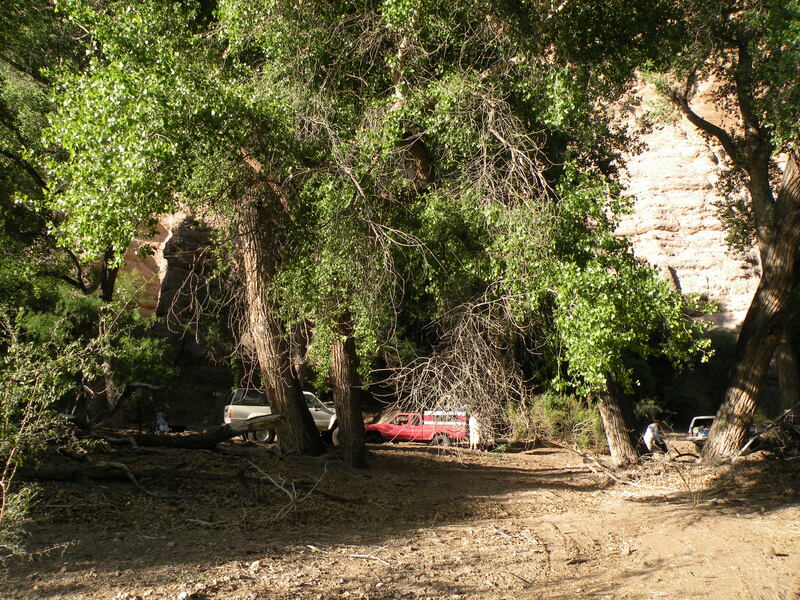 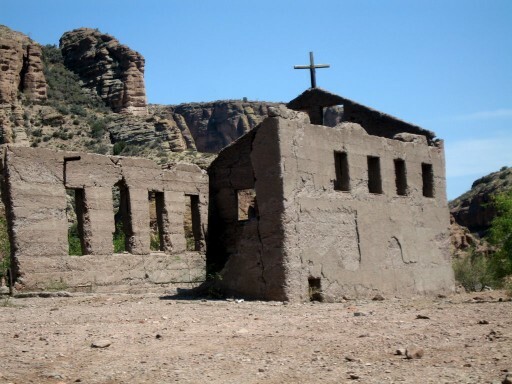 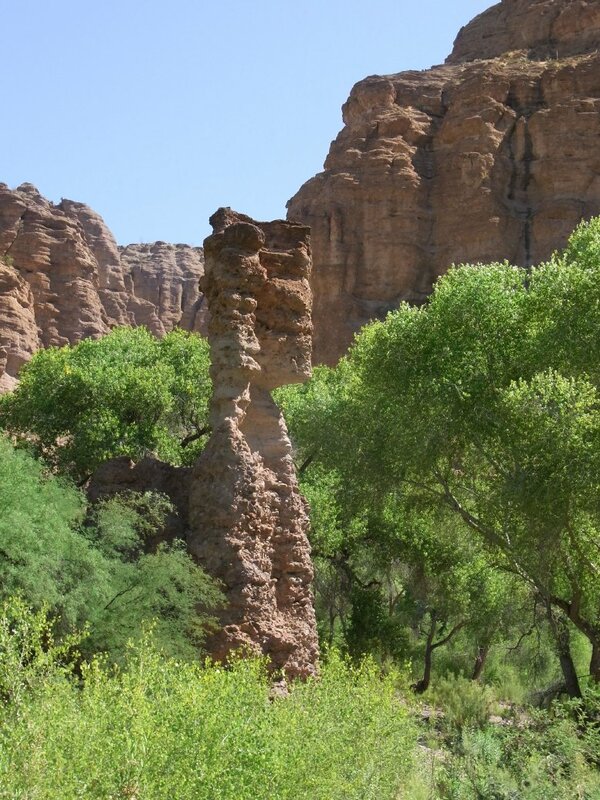 Native ruins near the confluence. 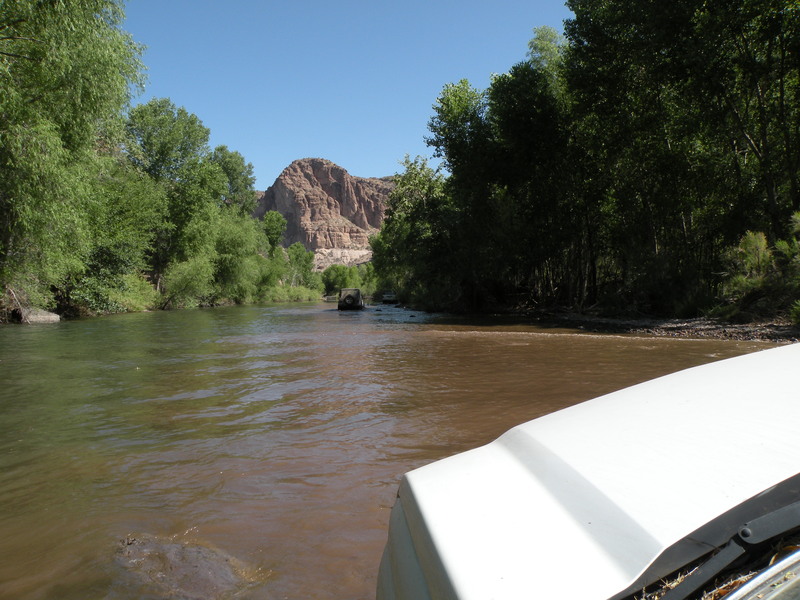 We continued upstream on Saturday morning. 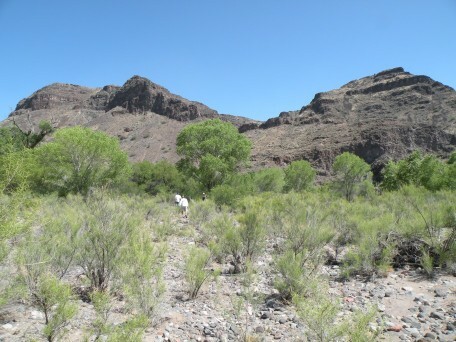 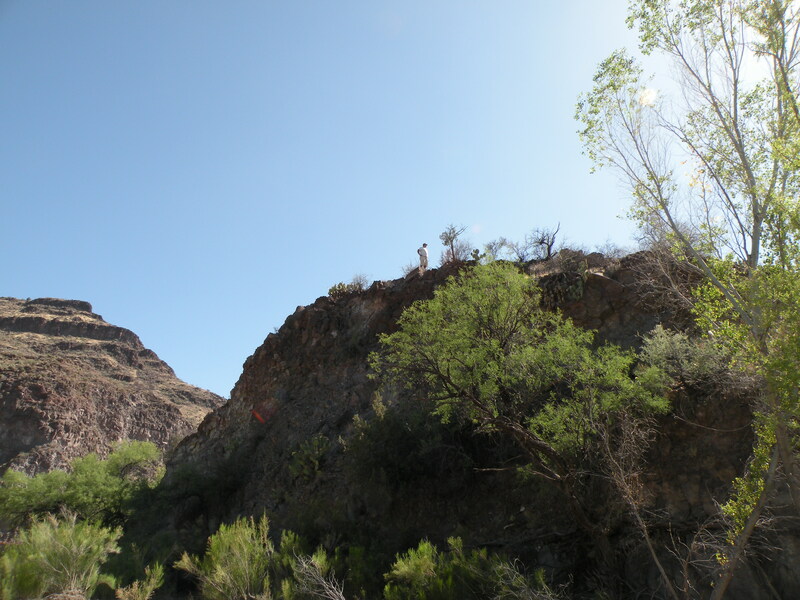 Bob and Rex went back to Tucson directly, while the rest of us stopped for a swim and then went to explore the section of Lower Eagle above the pump station. 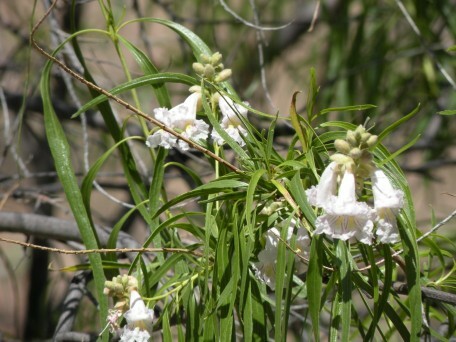 We had lunch in a shaded mesquite bosque about 2 miles above the pump station before heading back to Tucson. 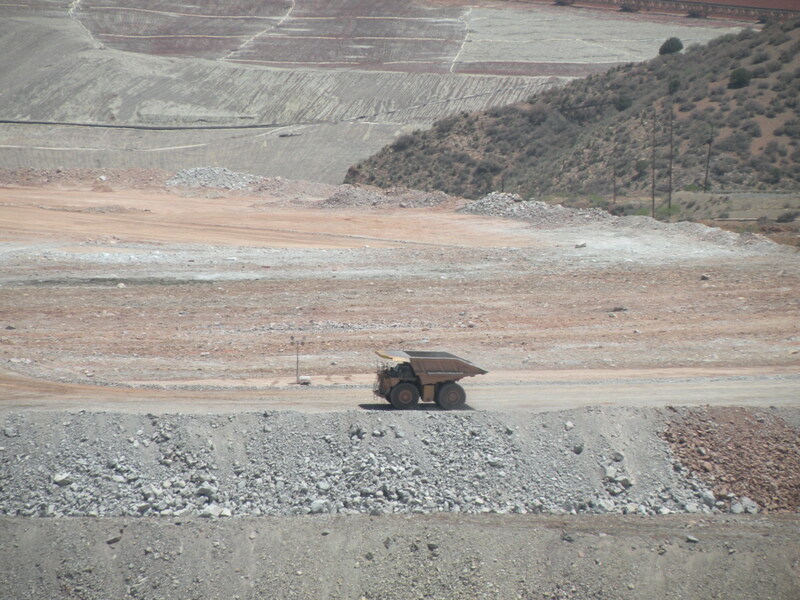 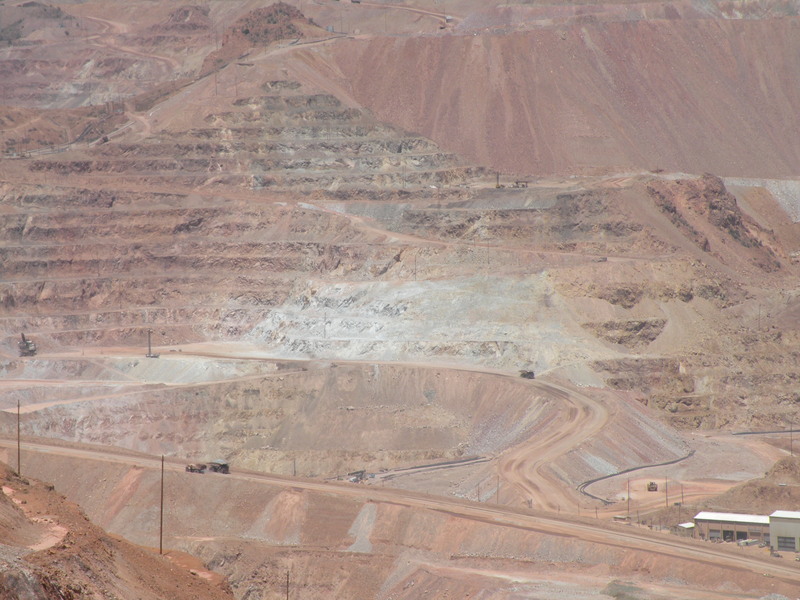 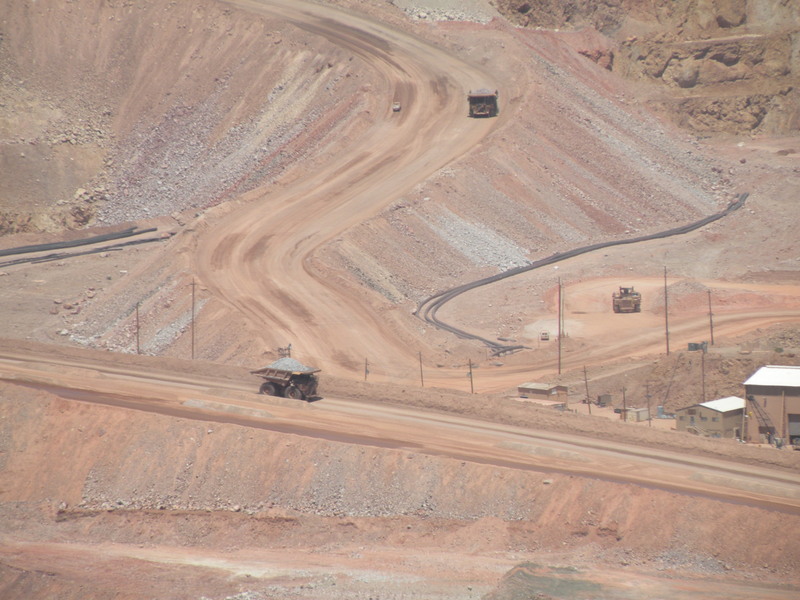 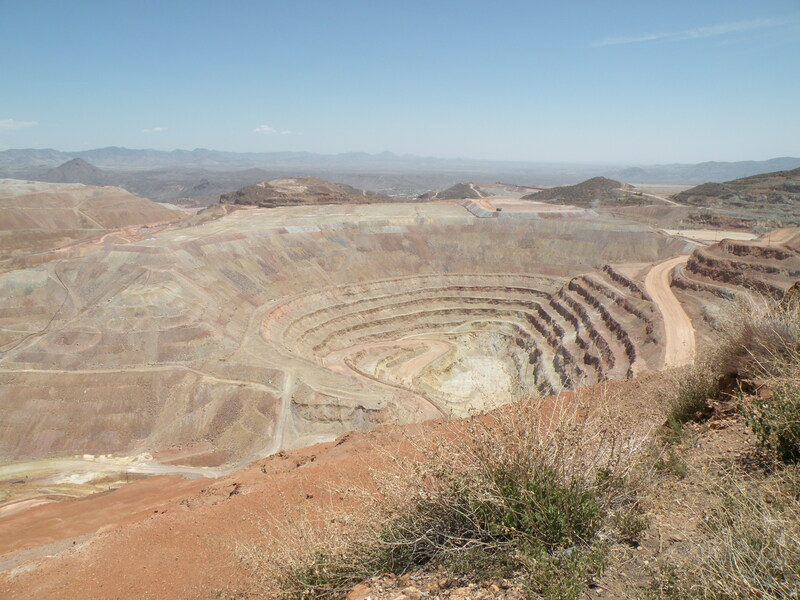 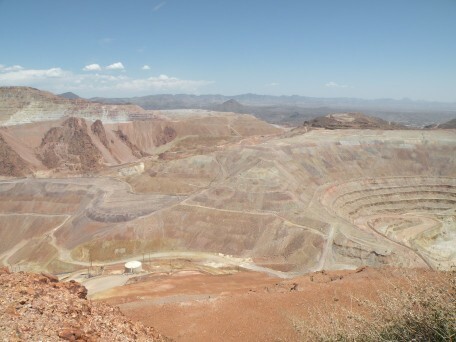 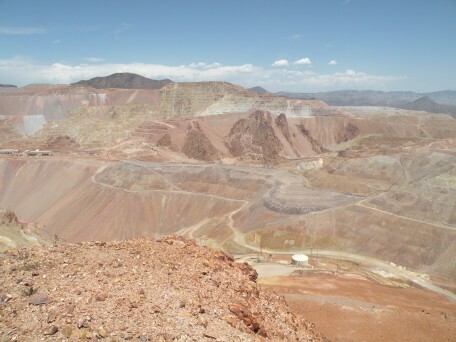 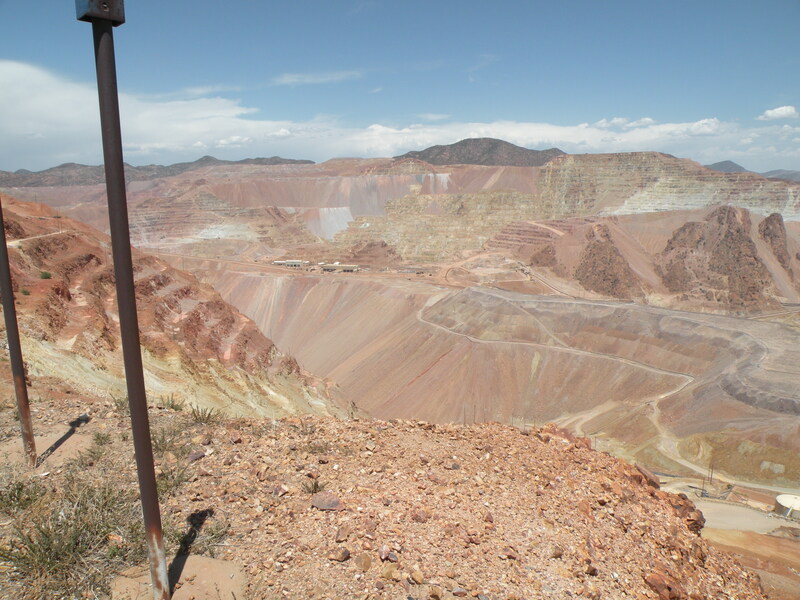 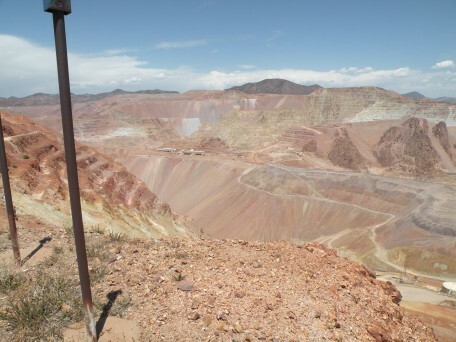 We stopped at the Morenci mine overlook to marvel at how much the open pit has changed in two years. We sampled the carne adovada burros at Chalo's in Safford on the way home. Vehicle damage included: a broken/lost shock bolt, a cracked front diff cover, a torn headliner, and a flat tire. Undercarriage dents and pinstriping don't count on this trail. 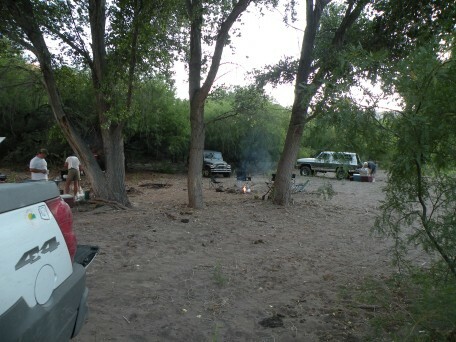 Friday night camp at the beaver dam. 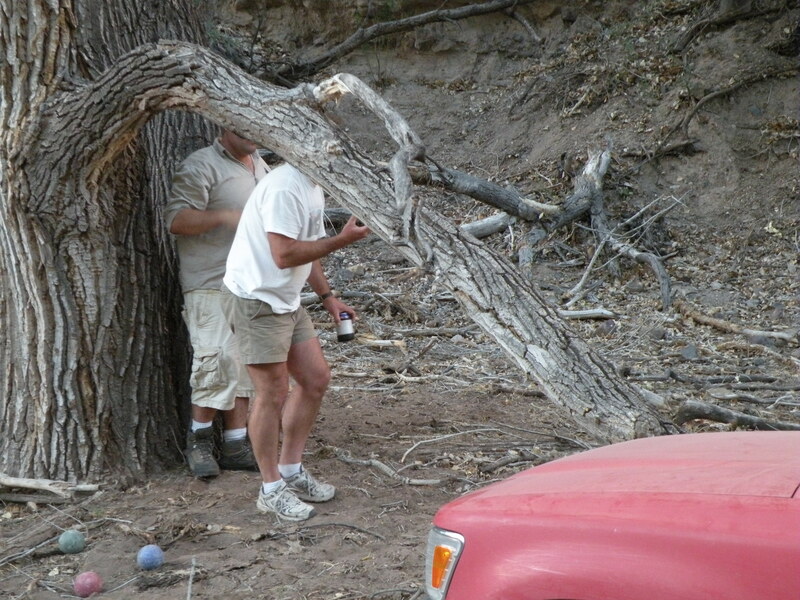 Big trucks in the Morenci pit. 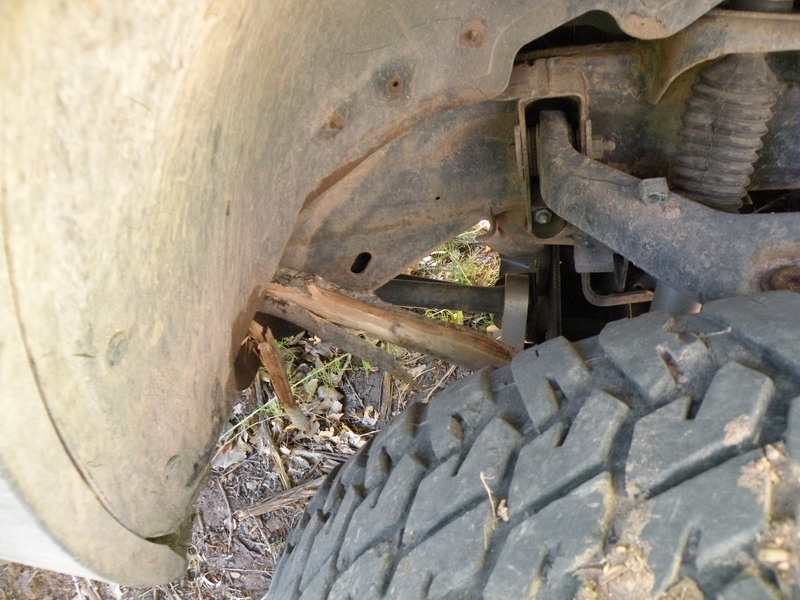 Replacing the missing shock bolt. 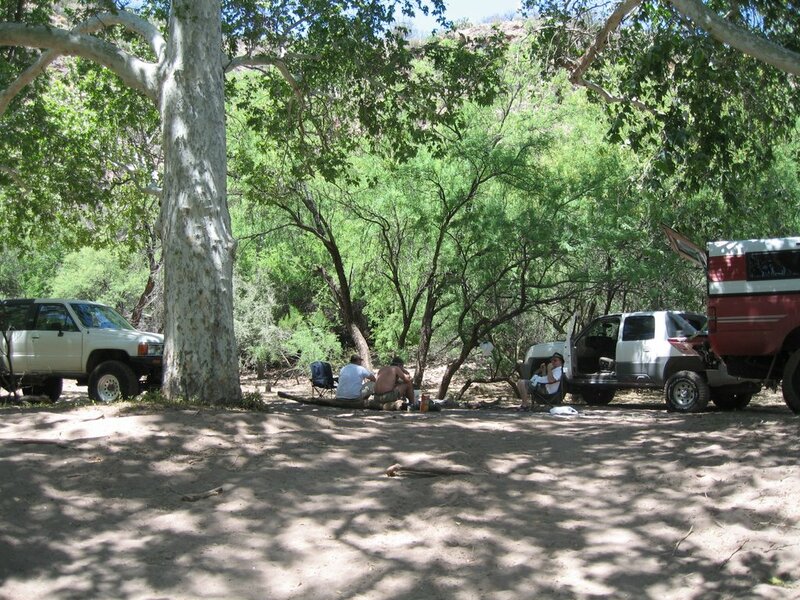 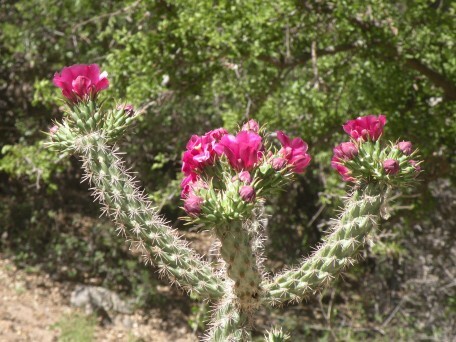 Lunch in the mesquite bosque. 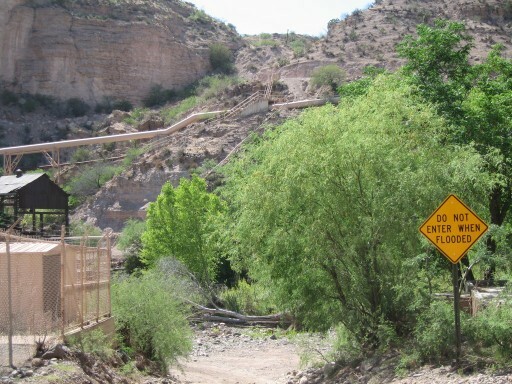 Diversion pool above the pump station.